Wait, wasn’t there a Space Marine release fairly recently? In fact, it’s already been almost two years, but it certainly doesn’t feel like it. 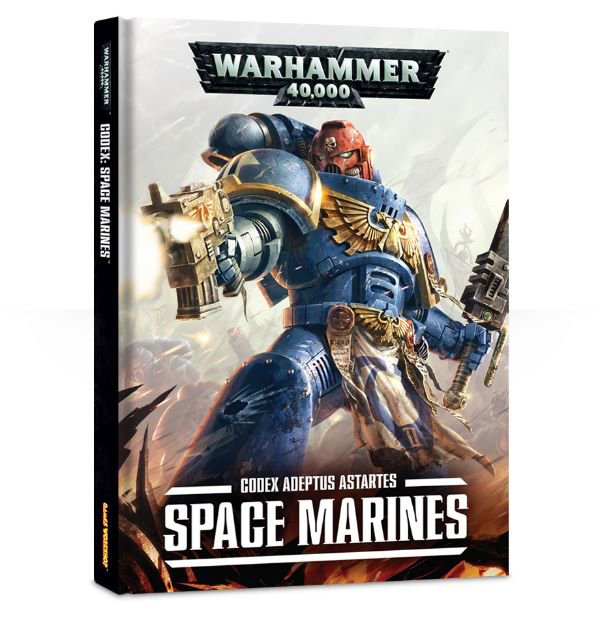 Granted, the Space Marines are 40k’s most popular faction and main cash cow, but even so, it feels like we only received a new Codex a very short while ago. But here it is, nevertheless, a new book, complete with a bunch of new kits to accompany it, so who am I to argue, eh? 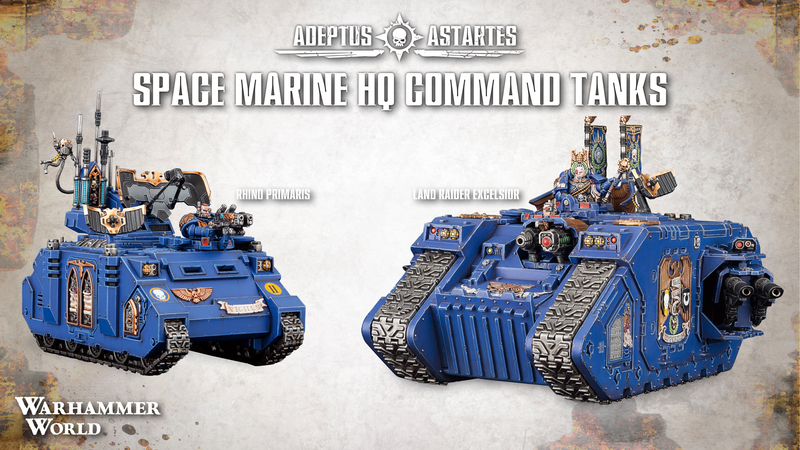 The thing is: 2013’s Space Marine release was a pretty big release all around, thoroughly revamping the standard Tactical Squad, giving us plastic Sternguard and Vanguard, introducing Centurions, grav weapons and two new, Rhino-based tank variants. 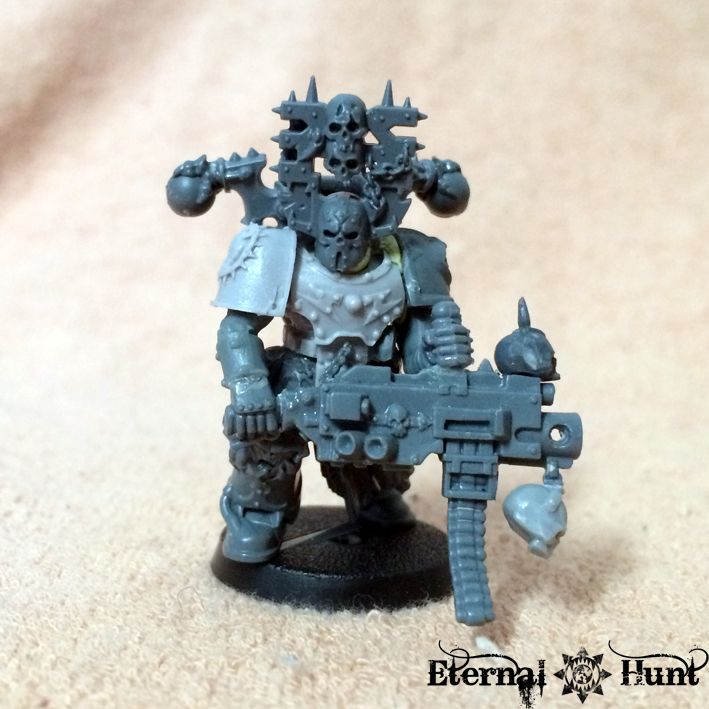 Plus we got new models for a couple of generic Space Marine HQ choices. So it feels like this new release does have quite a bit to measure up to. Let’s take a look at whether or not the new kits manage to hold up — and it goes without saying that we’ll also be taking a look at the various conversion options along the way! 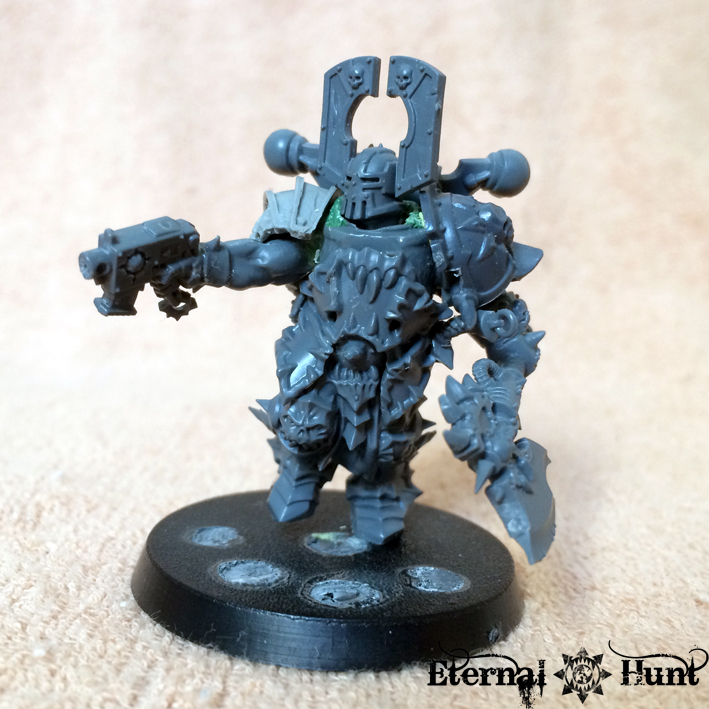 The clamshell characters are often a very interesting part of each release — one need look no further than the Tech-Priest Dominus as proof. 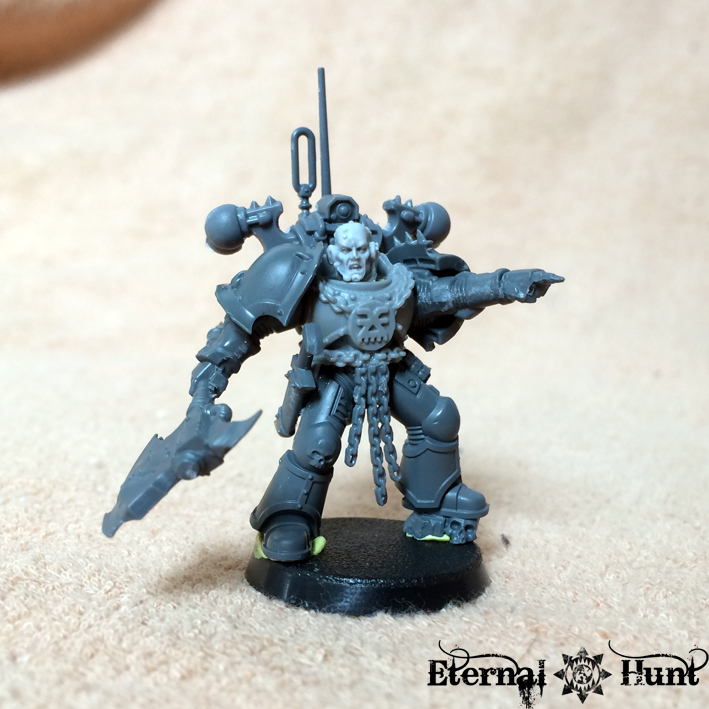 And the Space Marines receive another HQ option via this Librarian in Terminator armour. Tell you what: I think there’s something off about the model. Something I cannot quite put my finger on. 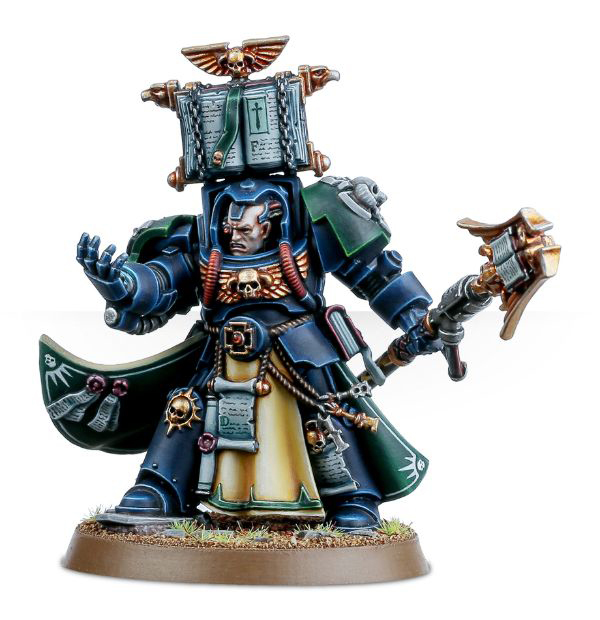 Sure enough, all the required boxes have been ticked: The model clearly reads as a Librarian, psi-staff, psychic hoods, lots of scrolls parchments and doodads — all accounted for. 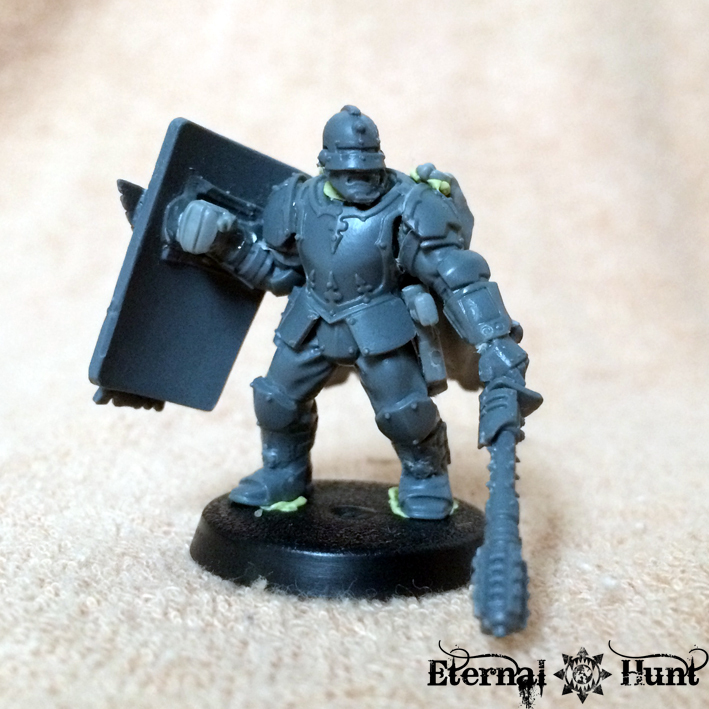 And the various details on the armour certainly look cool enough! And since this arm is far more interesting visually than the tired old Stormbolter anyway, all is well with the world, right? But all of this would probably be excusable, if not for the fact that the new plastic model is an inferior replacement to its predecessor and a better alternative is readily available. But all in good order! There’s also a much better flow about the model — something that can arguably be hard to capture in multipart plastic models. 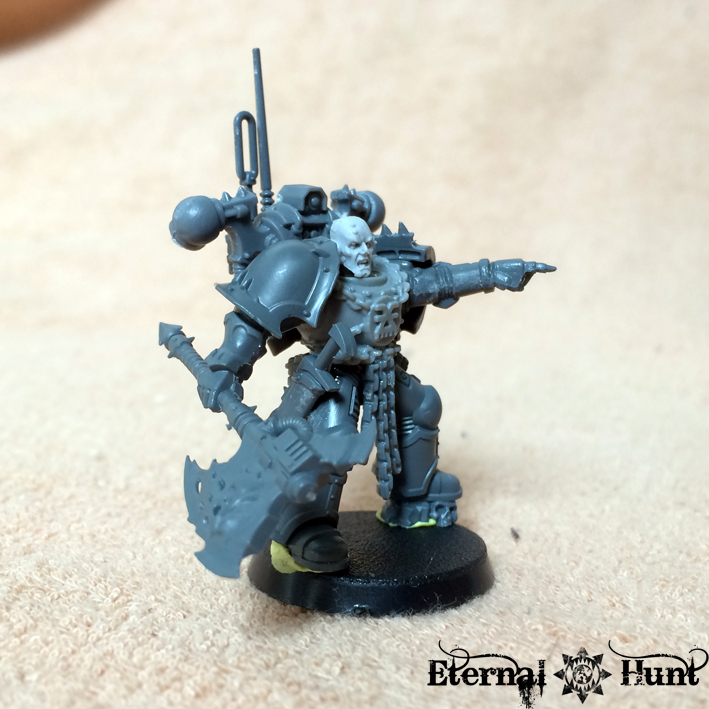 But then, the new Librarian isn’t even that multipart to begin with (compare the sprue above). 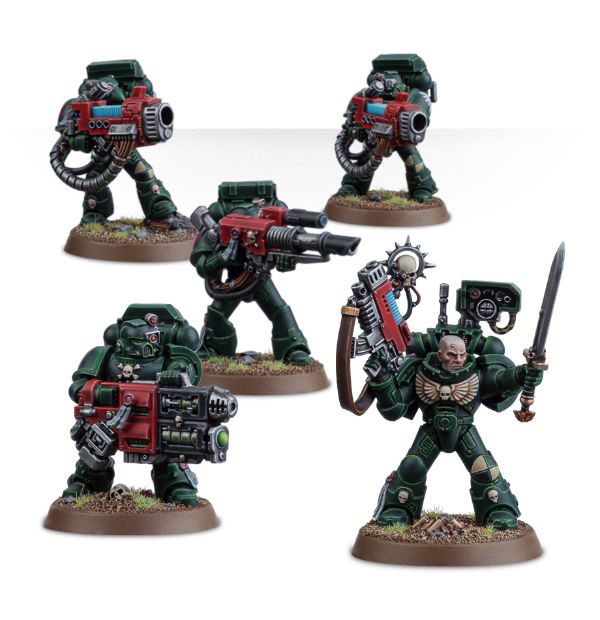 The Assault Marines were possibly one of the oldest plastic Space Marine kits still in service, so it certainly makes sense to give them a facelift. 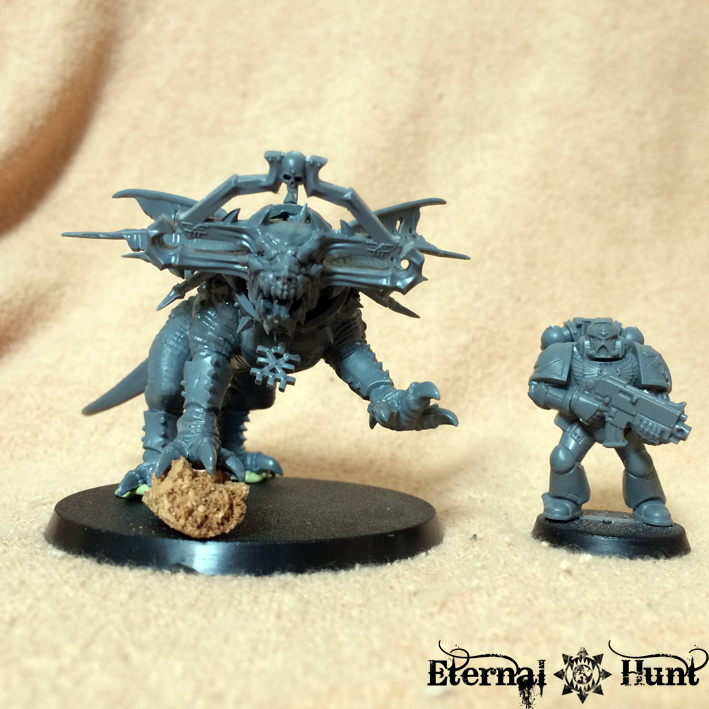 The new kit carefully updates the models and adds in some new options, yet at the end of the day, it still provides us with all the neccessary parts to build five Assault Marines, either with or without jump packs. 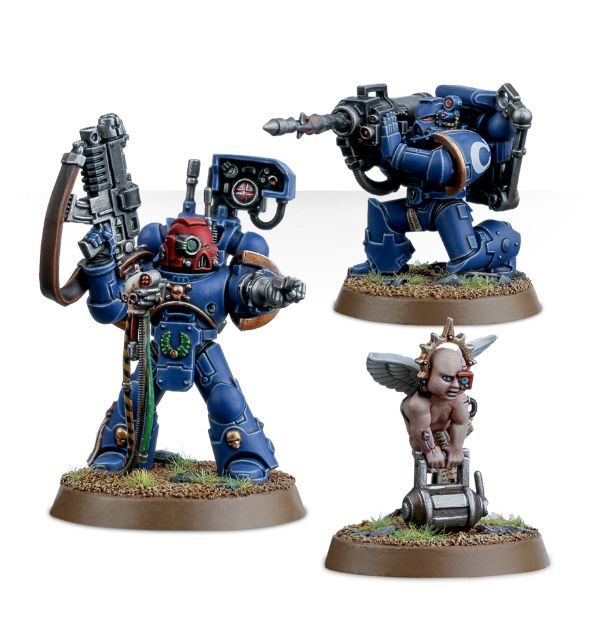 Some of the poses do seem a little awkward, though (like the guy on the left in the above picture) — although, in all fairness, assembling running Marines that seem natural always takes a bit of doing and fine-tuning. 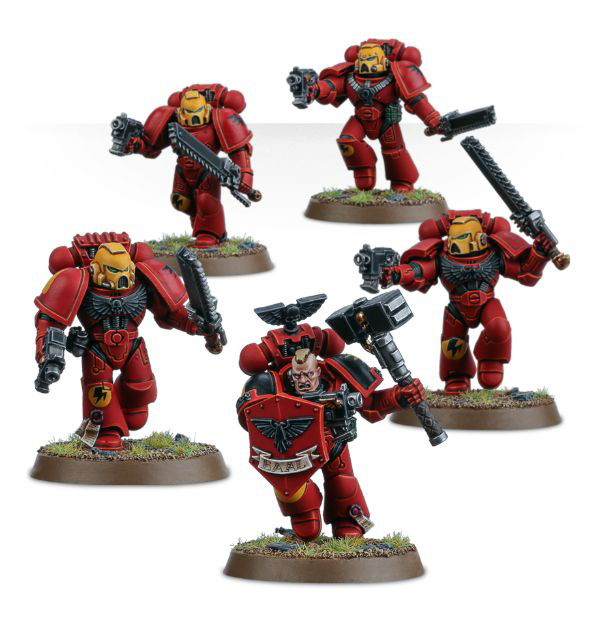 All in all, the kit seems like a sensible and careful redesign, and if you should find yourself in need of some additional Assault Marines (or simpply some running legs), it seems like a sound option: You get five Assault Marines without any massive bells and whistles to speak of. However, while having an updated kit is nice, it’s also pretty hard to get too excited about these models, because they are treading ground that has been thoroughly explored by several other kits. In fact, I would argue that almost everything this kit does, the Vanguard kit does better. And at merely two Euros more a pop, I know which kit I prefer. Solid work, certainly, but nothing to write home about. Beyond such concerns, it’s great to see that the new Devastator kit contains lots and lots of weapons (basically two each of every heavy weapon plus a bunch of combi-weapons, pistols and a full complement of CC weapons for the Sergeant). This makes the new kit very comprehensive when it comes to weapon options — and thus possibly an essential purchase. 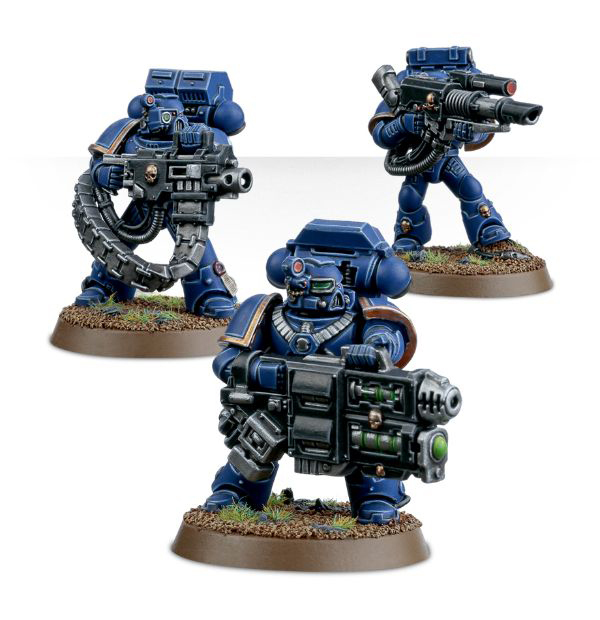 Both ideas are pretty cool, because they visually support the Devastators’ battlefield rule and add some identity to the models beyond the heavy weapons they are lugging around. 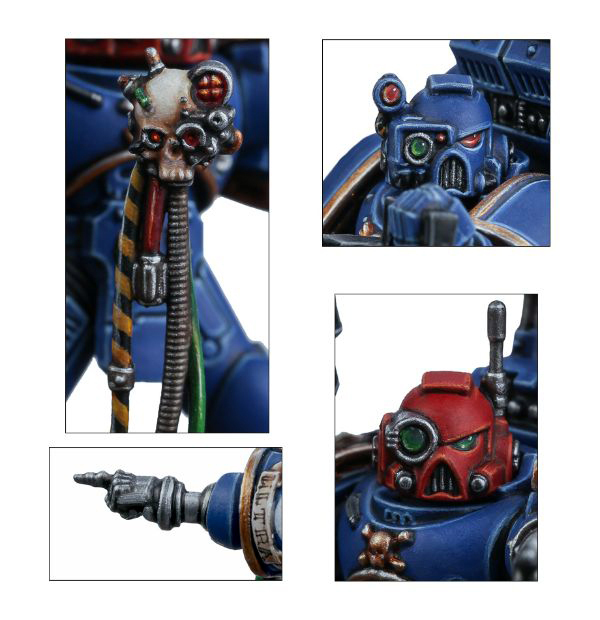 Even so, some of these new elements seem slightly uneven in execution: The extra sensors work far better on some helmets than on others (the one on the Marine with the grav gun in the above picture looks legitimately terrible, for instance). In fact, we get quite a few bitz and bobs for the squad that are pretty interesting: the rockets streaming smoke may be a bit hit-or-miss, but I like the inclusion of a cherub, even if the sculpt does seem a bit clunky — I wonder whether the paintjob is partly to blame for this…? 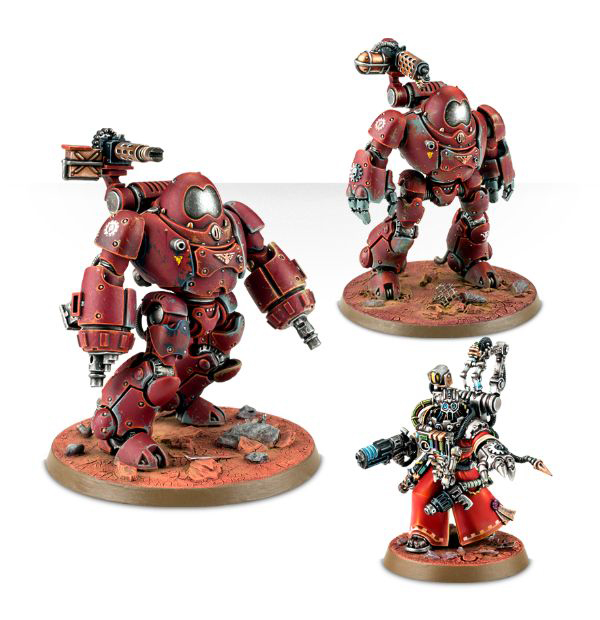 All in all, this kit seems far more substantial than the Assault Marines, and it should be legitimately useful for Marine players both old and new. A very solid, if not exactly exciting, offering! 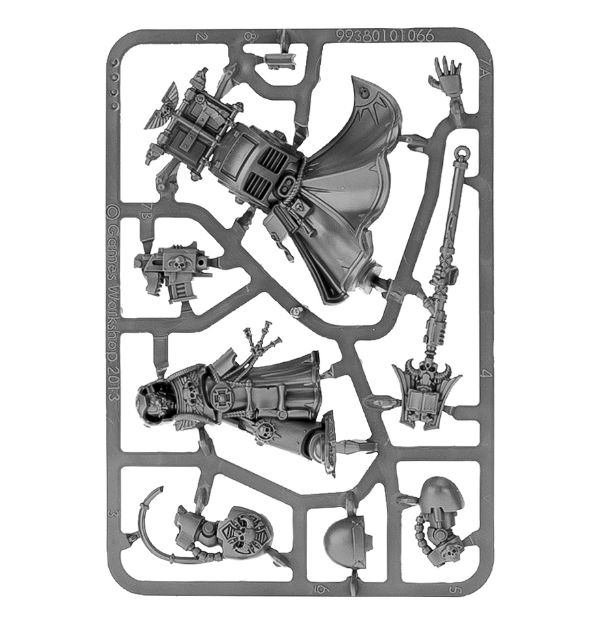 Now this is possibly the most interesting part of the release, at least for me: We get one conversion sprue each for the Blood Angels, Dark Angels, Ultramarines and Space Wolves — quite an interesting tool for customising champions and army commanders, and a possible return to offering conversion sets and bitz? We will see. 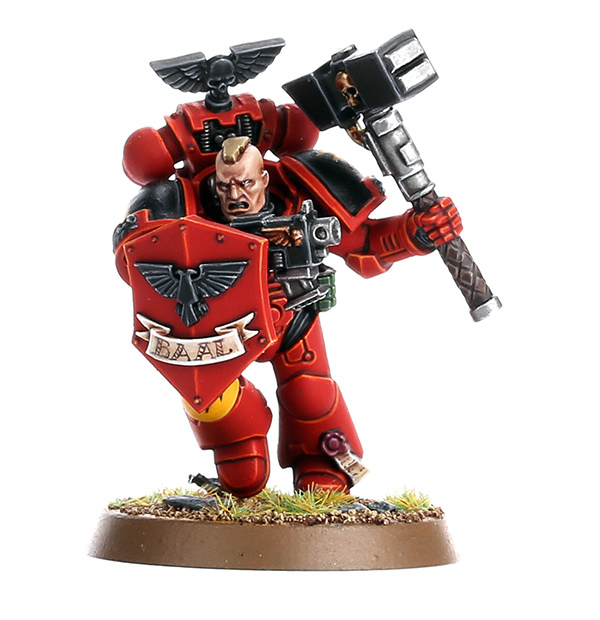 The Blood Angels sprue is possibly the least interesting of the bunch, seeing how most of the bitz seem to appear in one of the existing BA kits in similar shape or form. 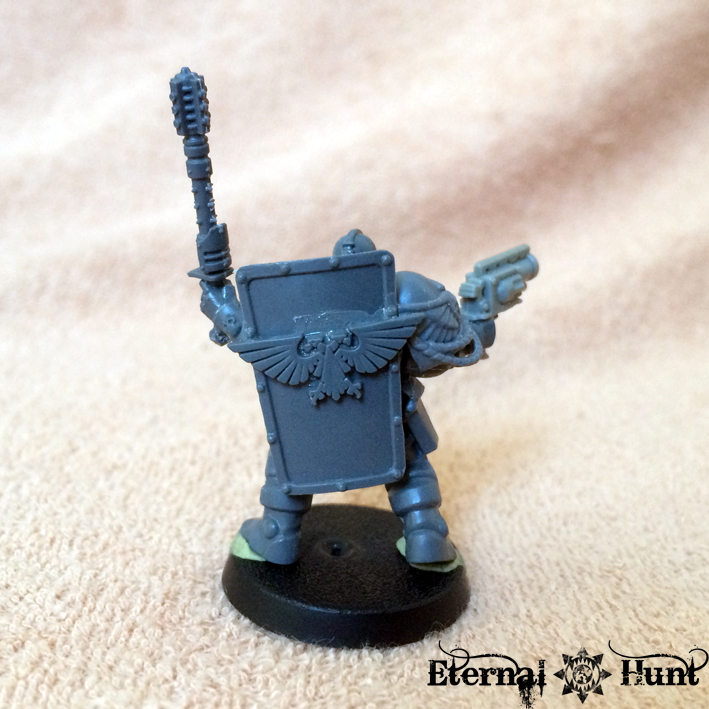 The Mephiston-style torso piece is a notable exception, but most of the other contents of the sprue are very close to the stuff we get with the Sanguinary Guard, Death Company and BA Tac Squad. 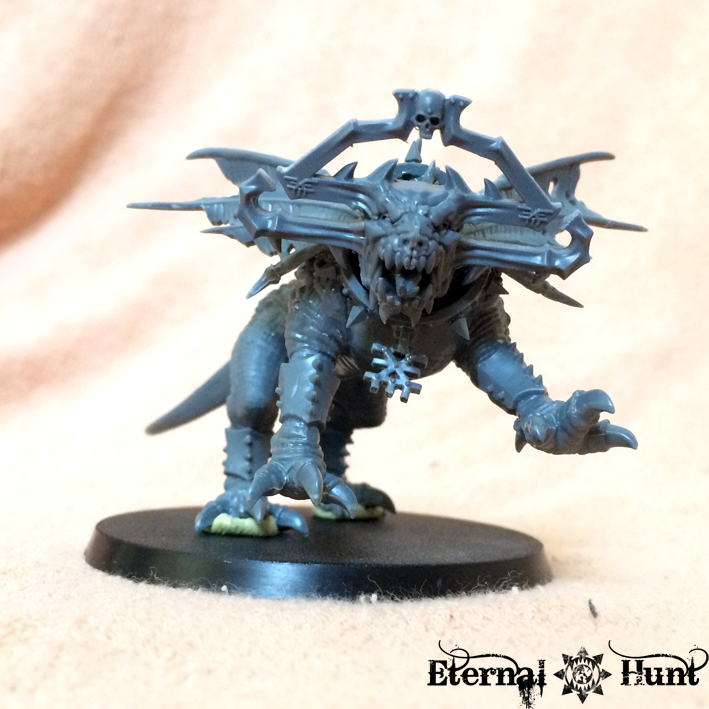 So while the bitz themselves are fairly cool, there’s nothing super-exciting here. Next. 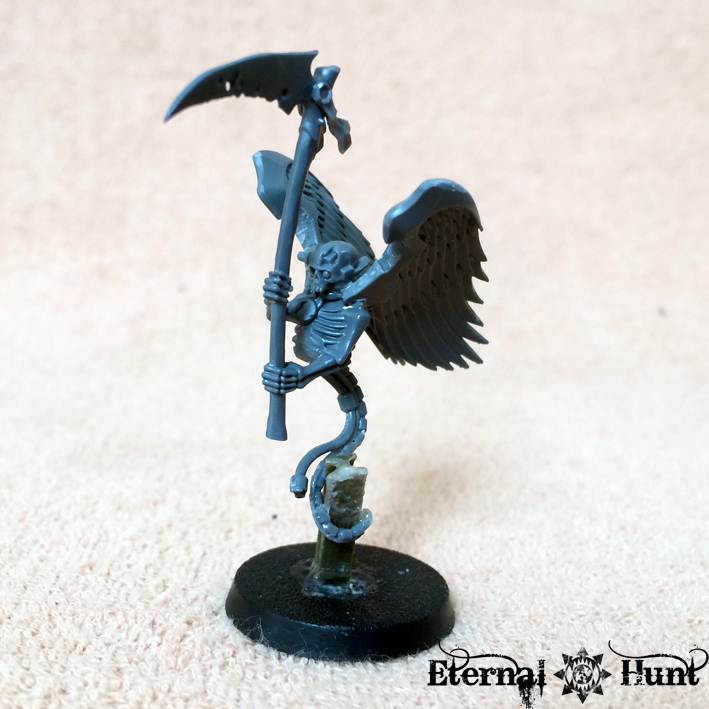 The Dark Angels sprue suffers from a similar problem, but that’s mostly due to the fact that there are already several kits with lots and lots of DA conversion bitz in existence. The standout parts here are the mastercrafted breastplate, highly ostentatious sword and plasma pistol. 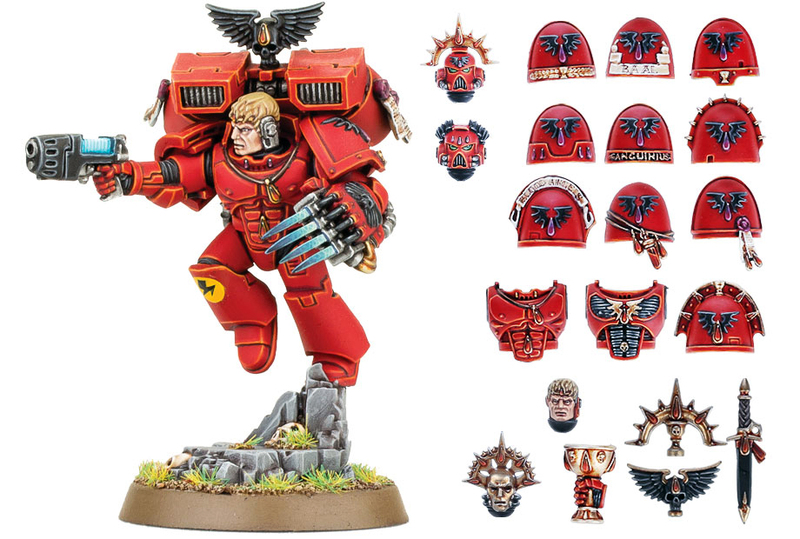 The feathered helmet is a staple of DA lore but looks very clunky — I’d pick the Chapter Master helmet from the Dark Vengeance boxed set over this helmet any day of the week. Again, pretty nice, but ultimately nonessential. 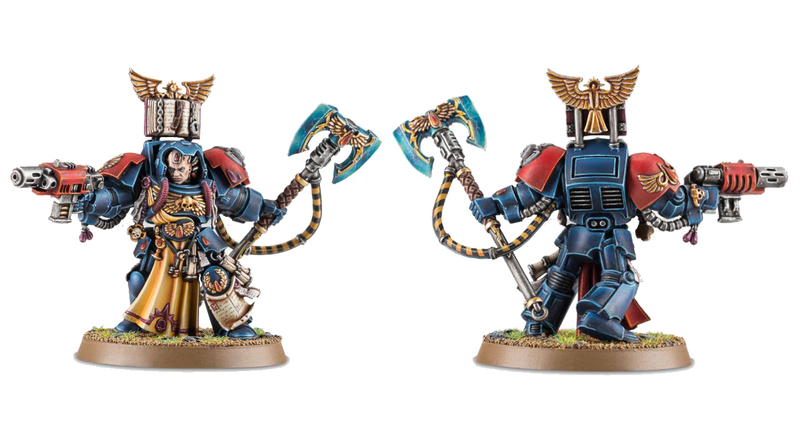 The Space Wolves have just as many dedicated plastic kits as the Blood Angels and Dark Angels, yet their conversion sprue still turns out more interesting: The sword and axe are very sweet (and seem to be channeling the look of Krom Dragongaze’s weapons). 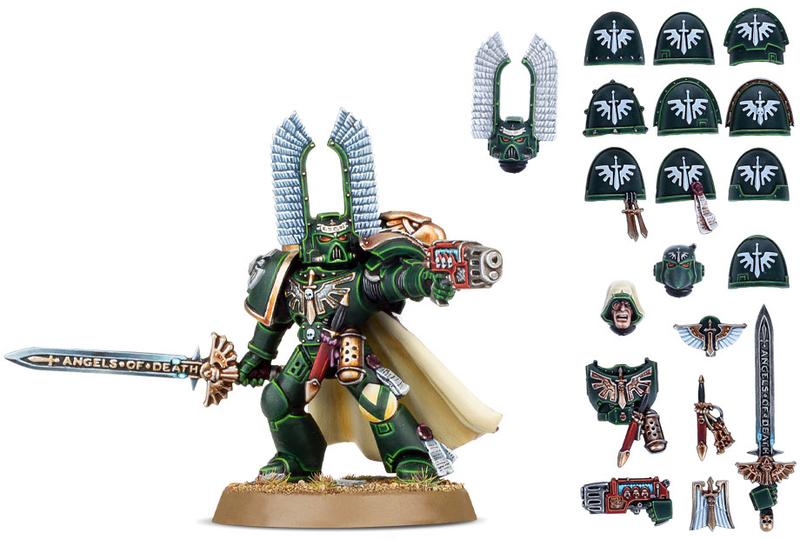 The backpack also seems similar to his and is very cool — I love the vicious look of those wolf heads. 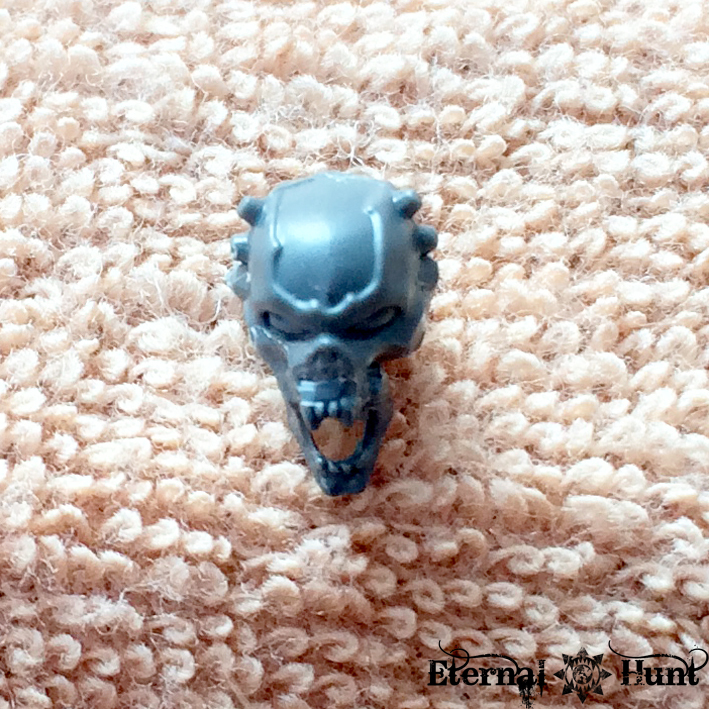 Speaking of which, I thik the wolf head helmet is probably my favourite part of the sprue: Some may think it’s too cartoony, but I love how feral it looks. 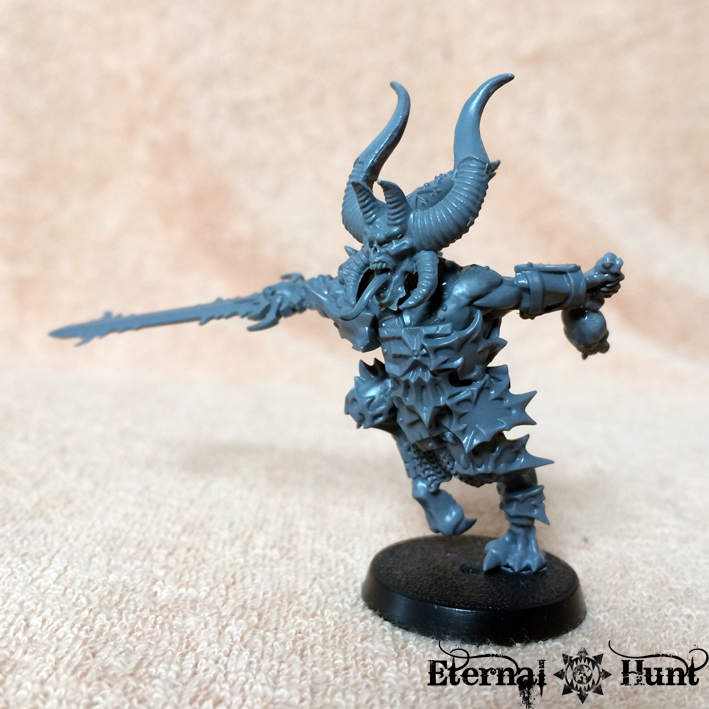 It’s far less stylised than the helmet we get as part of the existing SW sprue, and I think it would work just as well for a champion of chaos. 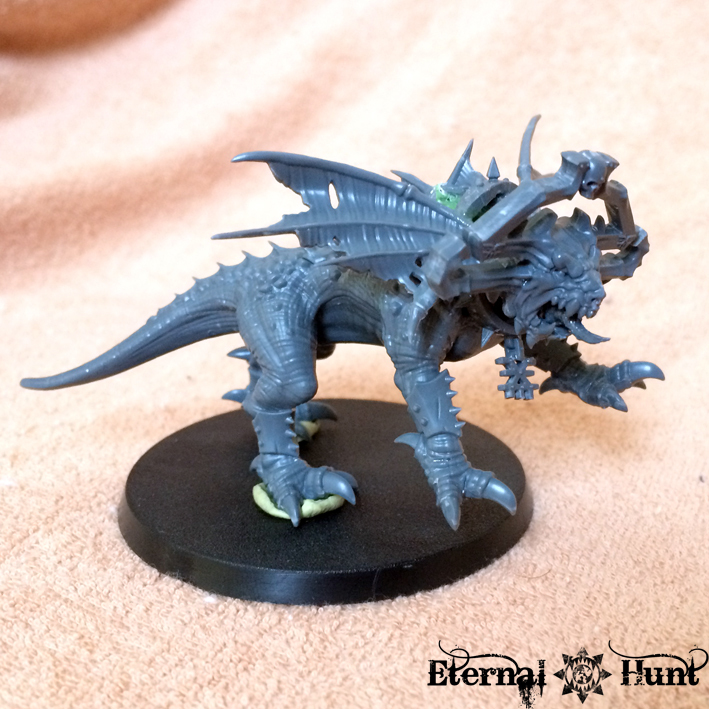 This is a pretty cool conversion kit, mostly because it manages to move beyond the bitz that are already available as part of the regular kits. 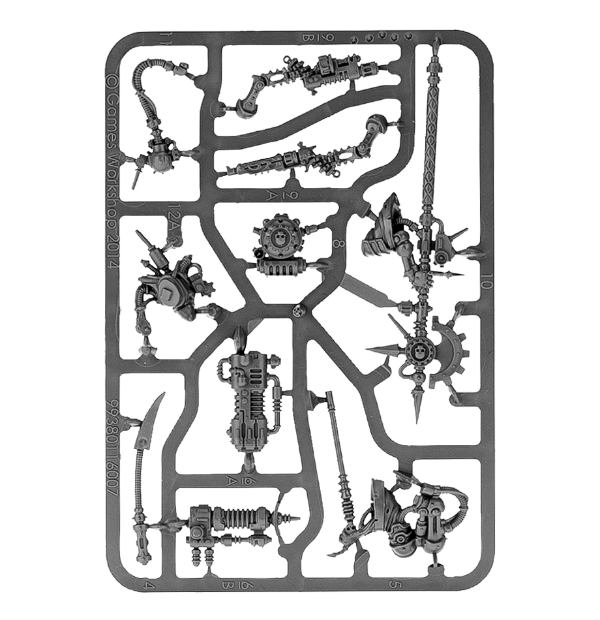 And finally, the sprue for everybody’s favourite Do-Gooders, the Ultramarines. And you know what? This is definitely the best of the bunch! 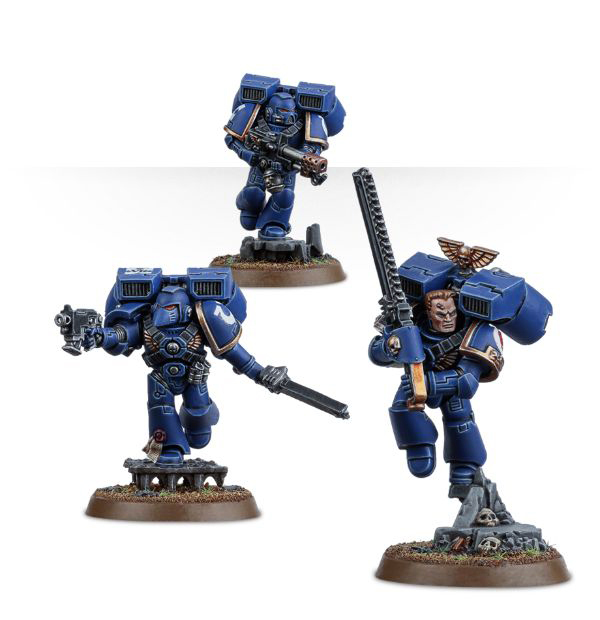 Because, for all their appearances in the background and posterboy status, the Ultramarines have never received any dedicated plastic kits, so this is our chance to finally make our Ultramarines characters look like true Ultramarines: The shoulder pads are obviously useful for that, but my favourite parts have to be the breastplate, sword and gladius combo and the knightly veteran helmet. 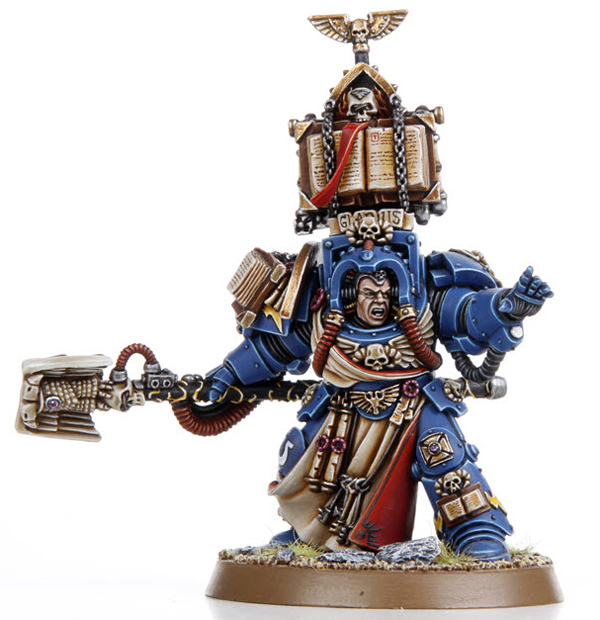 I have never been a huge Ultramarines fan, but I really like this conversion kit because it provides something new in plastic — very cool! All in all, the pricetag on these sprues may indeed be a bit steep, but I am prepared to call them a fairly promising experiment: If you want to use these for your whole army, you’ll be spending quite a lot of money — but that’s not the point: Each of the sprues would work perfectly for customising one or two models per army and really make them stand out — all you need are some Marine legs and bodies, and you’re golden. Which puts them at an ultimately reasonable price point below the – fairly expensive – new clamshell characters. What’s more, they certainly don’t force you to pick these up: You’ll still be getting lots and lots of leftover bitz that can work just as well from your regular kits. But as it stands, these new kits seem like a promising prospect, and it’ll be interesting to see what GW does with this approach. 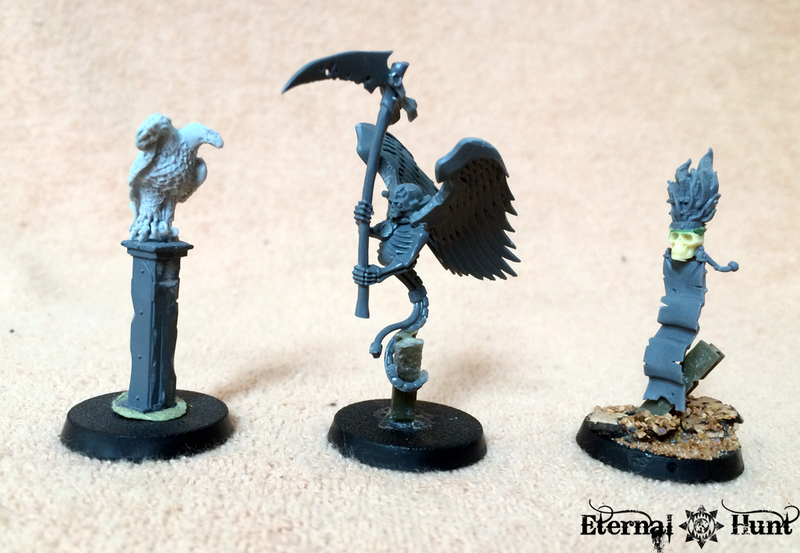 And I wonder whether these have anything to do with Forgeworld’s own, legion-specific upgrade packs…? 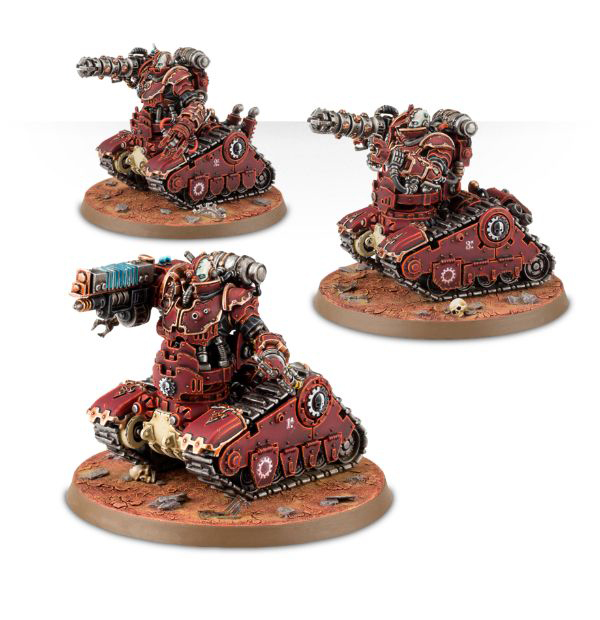 I think the boxy Space Marine tanks can use all the help they can get in order to look more interesting, and offering conversion kits to turn them into suitably ostentatious command vehicles seems like an interesting option. From my impressions, some things about the kit are pretty awesome, and some are pretty awful. Let’s start with the bad stuff: Those aquila-shaped radar dishes and the sensor array on top of the Rhino are pretty terrible. Seriously, there is such a thing as too clunky. 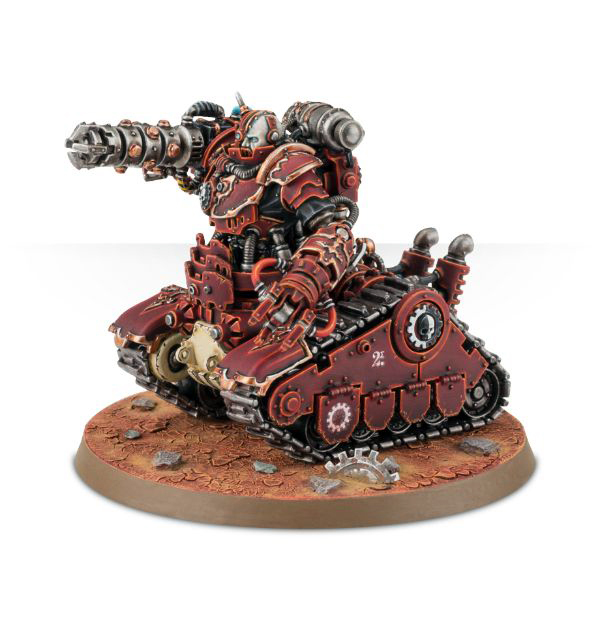 What I really like, however, are the alternate side panels, because they really make the vehicles look like relicts of a bygone age — ancient artifacts of the chapter that also happen to be warmachines. 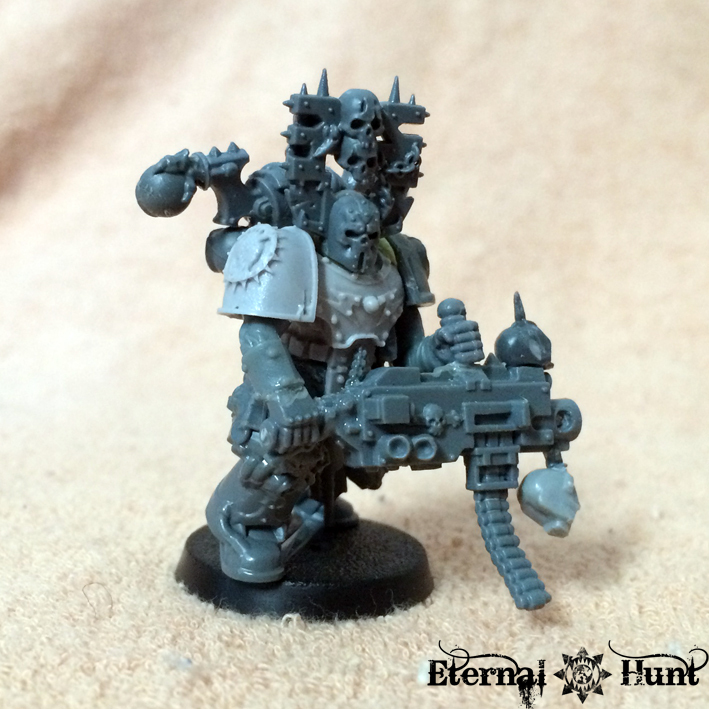 And I do have a bit of a thing for the Chapter Master atop the Land Raider — pretty cool! 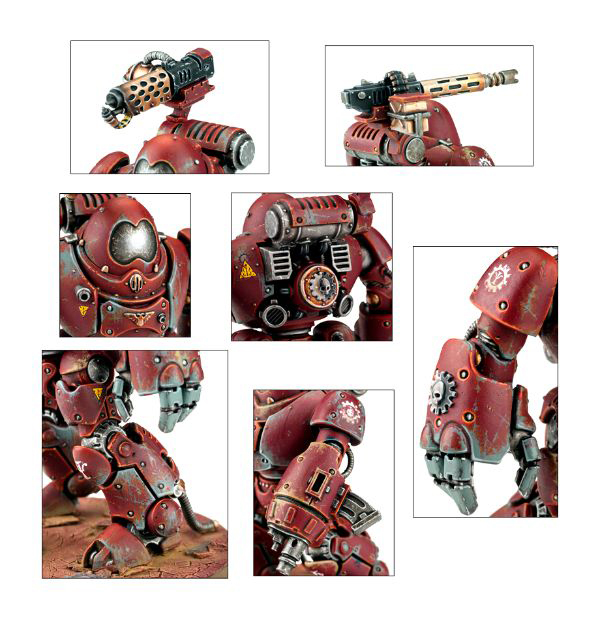 So does this kit alone warrant a trip to Warhammer World or is it worth the hilarious prices some folks are asking on ebay? The answer to either would be no, if you ask me — although there are probably enough reasons for wanting to check out the new Warhammer World. 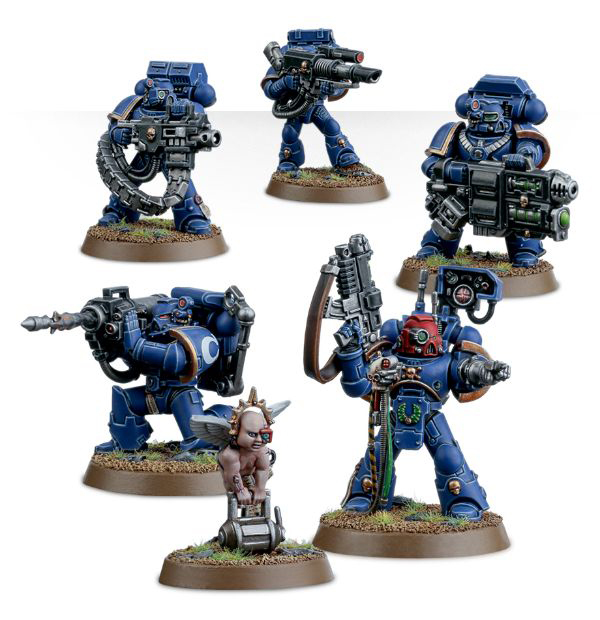 One of the biggest strengths of the entire Space Marine catalogue is how it provides an interlocking system of fully (or mostly) compatible kits, and the same goes for the new kits, of course: Whichever of these you pick up, you’ll always end up with more stuff for the huge Space Marine toolbox. And there’s no question that, for instance, all the extra stuff within the Devastator kit will prove hugely useful. 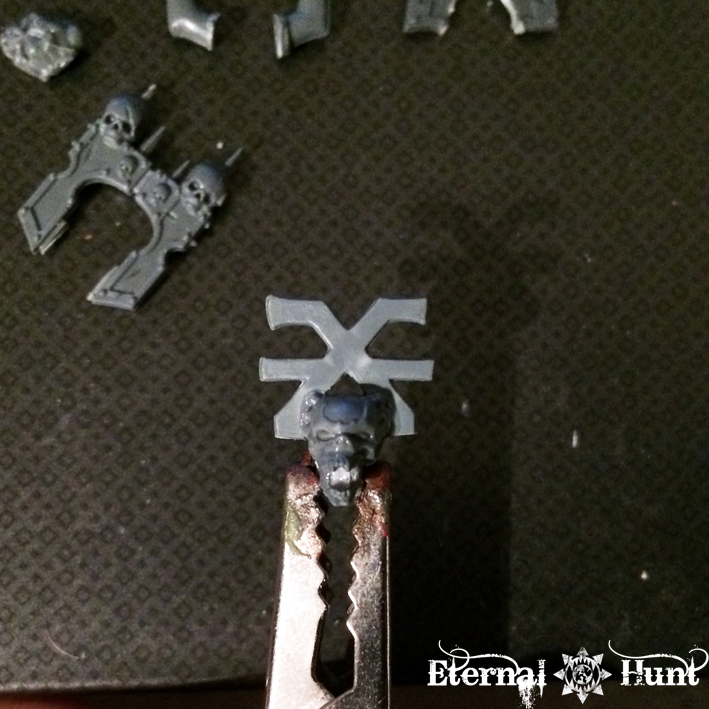 So the release certainly provides new tools for all the (Chaos) Space Marine players out there. I’ll be honest with you, though: No part of the release strikes me as particularly exciting or fantastic from a converter’s perspective. The things that interest me are mostly different bits and bobs: The pieces of rubble, Eviscerator and mostly bald head from the Assault Squad (because the latter would be great for a World Eaters officer). The servo-skull and cherub from the Devastators (because one can never have enough servo-skulls and cherubs in INQ28). The sword from the DA conversion set (because one can never have enough blinged out swords). 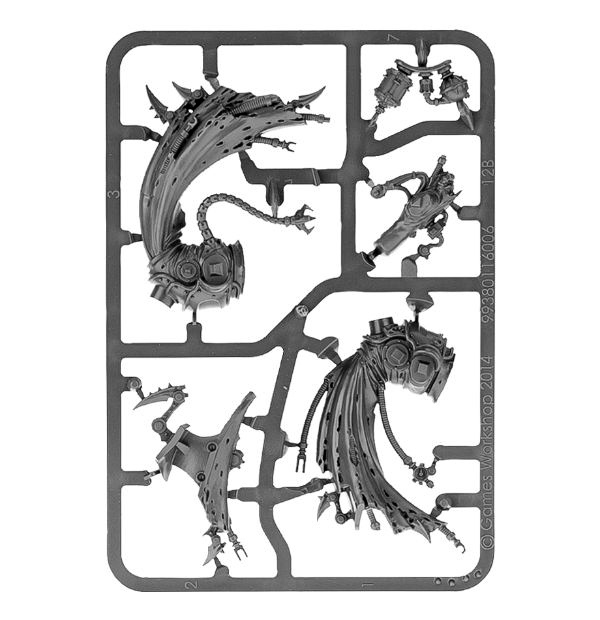 And possibly the entire SW and Ultramarines conversion sprues (the SW sprue is, once again, full of cool options for World Eaters, and I just like the design of the Ultramarine bitz and the novelty of having Ultramarine parts available in plastic). Many releases can become exciting even for those hobbyists who don’t play the army at hand. But this certainly isn’t one of those releases: It’s rather a workhorse of a release, replacing some outdated kits and tentatively offering some customisation and conversion options that might become more interesting in the future. 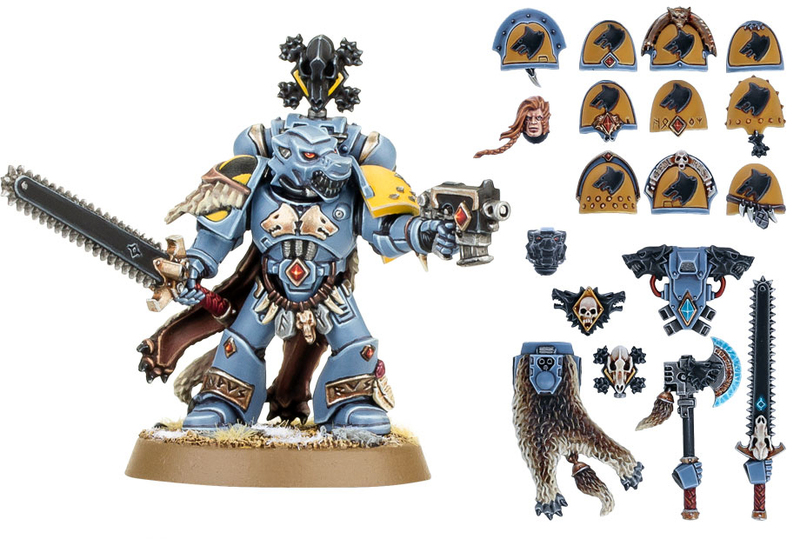 I have always loved Space Marines, but even I cannot really get excited about the new kits — the most interesting part for me are the conversion kits, and even those are mostly interesting for what they could become for other armies or factions somewhere along the line. 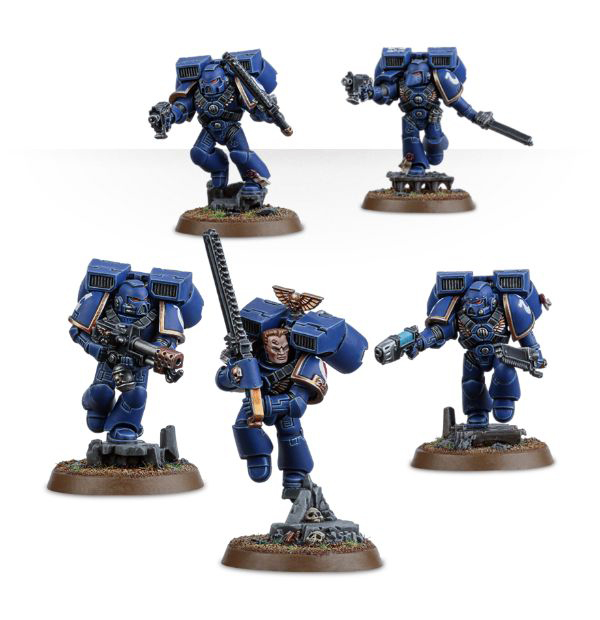 Comparing this release to the recent AdMech extravaganza, one cannot help to see the new Space Marine kits as a disappointment, because they are ultimately just more of the same. 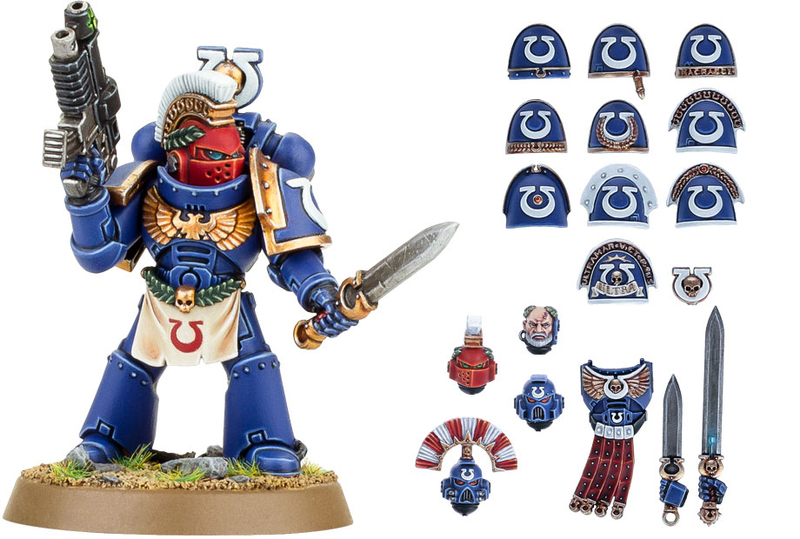 The 2013 Space Marine release was more interesting, because we actually got something new (the Centurions, whether you like them or not), and the redesigned kits (Vanguard and Sternguard) were pretty exciting. So what do you think? 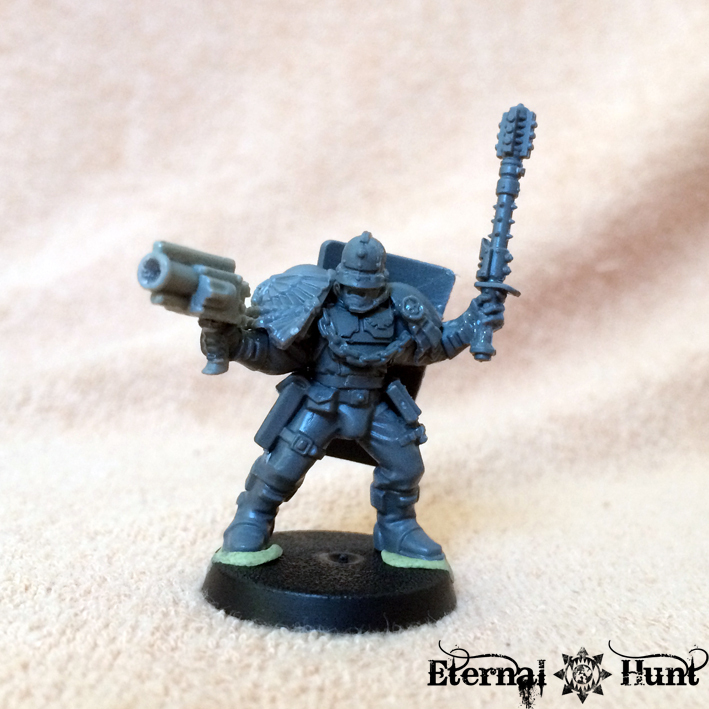 Do you feel differently about the new Space Marine kits or would you like to discuss some crazy conversion ideas of yours that I didn’t think of? I’d love to hear from you in the comments section! 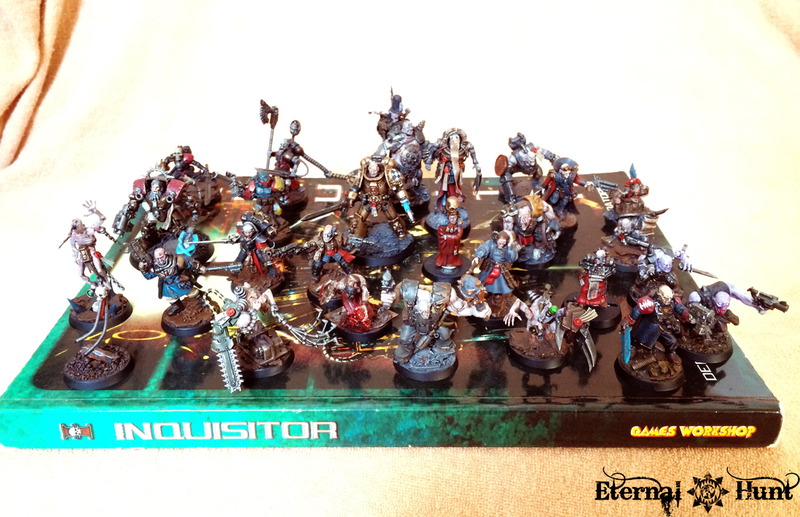 After the recent post showcasing the current status of my World Eaters army, I thought it might be fun to prepare a similar post about my INQ28 collection — after all, the World Eaters and my Inquisitor-themed models have certainly been my two biggest projects, ever since I got back into the hobby: To me, the world of the Battle for the Emperor’s Soul continues to be one of the most fascinating parts of the hobby, and one that I always return to when looking for an outlet for my creativity. I think we can all agree that the resemblance is rather uncanny — which is why I decided to turn the pilot into an Enforcer: A tough Hive Cop who has walked the beat on the wrong side of the monorail tracks a thousand times and knows the shadier parts of the Hive City like the back of his hand. As you can see, giving him one of the characteristic power mauls was really easy, and I also added some gloves on his belt, because I really liked the idea of him wearing some kind of riot cop gear for tough arrests. 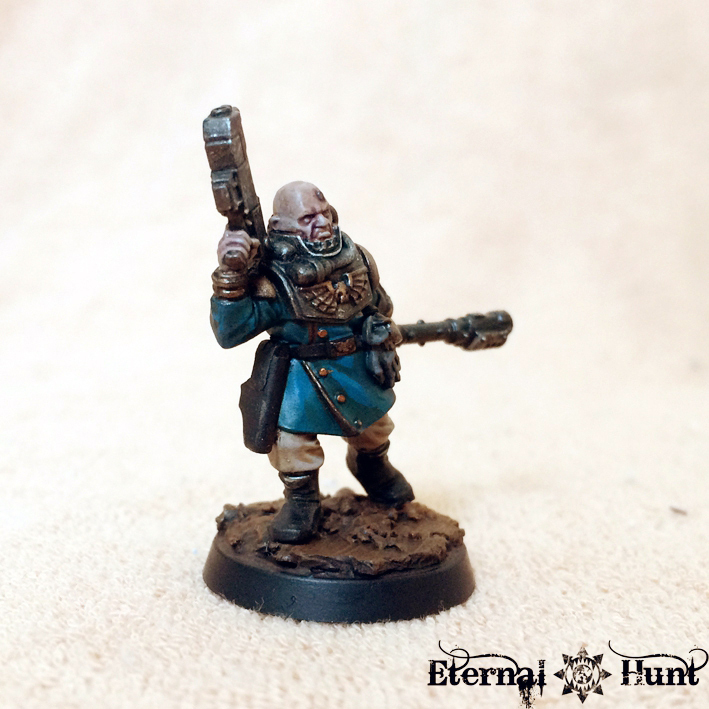 I went for a look resembling a steampunk 19th century Nightwatchman, since that seemed to fit both the character and the eclecticism of 40k. I also made one last addition to the model, as I felt a Skitarii Vanguard helmet would nicely complement the rest of his gear, so I added one to his belt. All in all, I am really happy with the model: The look I wanted is clearly there, and there is a weight of years and experience to him that I really like. 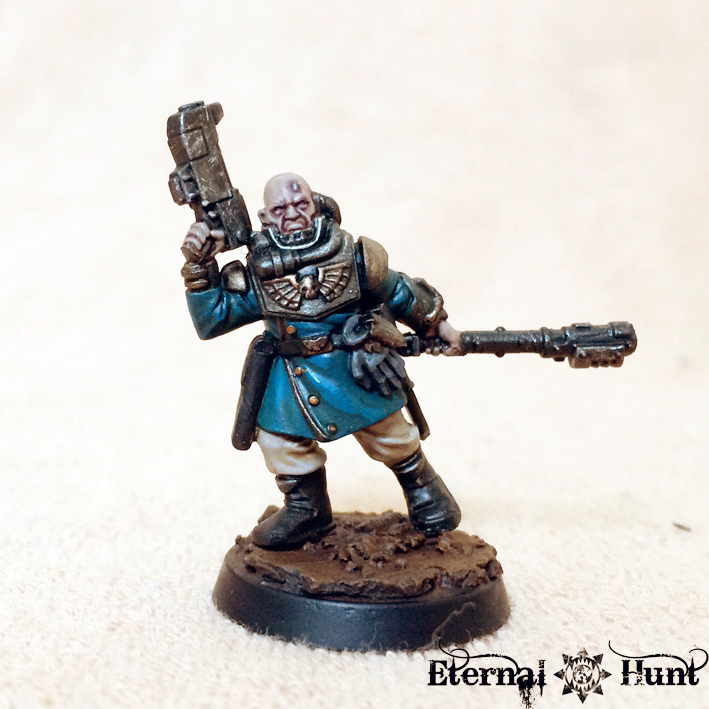 I’ve already started to think of him as a character, which is always a good sign: This is Remus Ingram, veteran of the Riftyr Hiveguard on Saarthen IV, capital world of the Metyan Subsector of Velsen. 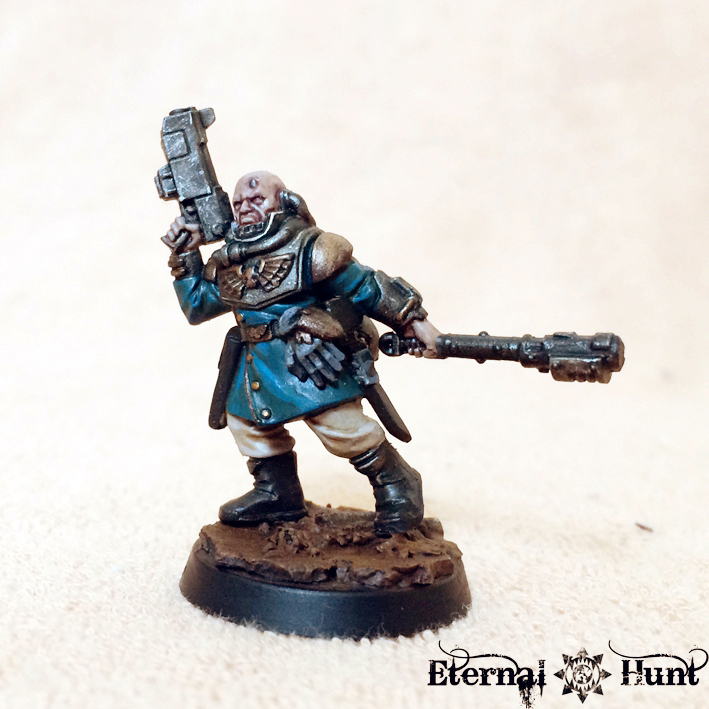 After long years spent in the perpetually gloomy and rainy underhive settlement known as “Ashertown”, Ingram was recruited by Inquisitor Erasmus Gotthardt after a joint operation in the depths of the Hive. The obvious star of the show here is Praetor Janus Auriga, my true scale Marine. I am still extremely happy with this model! There’s also Sister Euphrati Eisen, of the Order of the Martyred Sword. And let’s not forget Inquisitor Brynn Yulner (the model that re-invigorated my passion for painting INQ28 characters), the wonderful, custom Arch-Deaconne Drone 21c donated to my cause and the brilliant Astropath conversion Ron Saikowski sent me (including that last model is a bit of cheating on my part, seeing how it already came beautifully painted). To learn more about these last three characters, head over here. Not a massive pile of miniatures, certainly: Merely some thirty models. 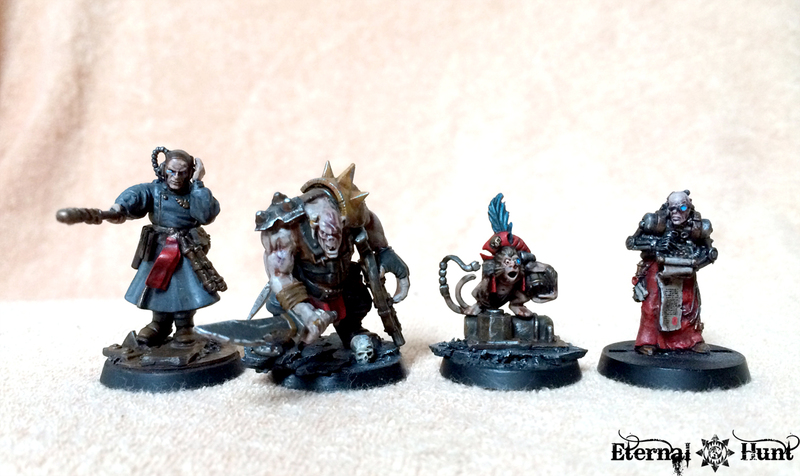 But still, I am really happy with these, because each of them is a handcrafted character exploring a particular part of the 40k lore. And they make for a rather interesting menagerie, don’t you think? 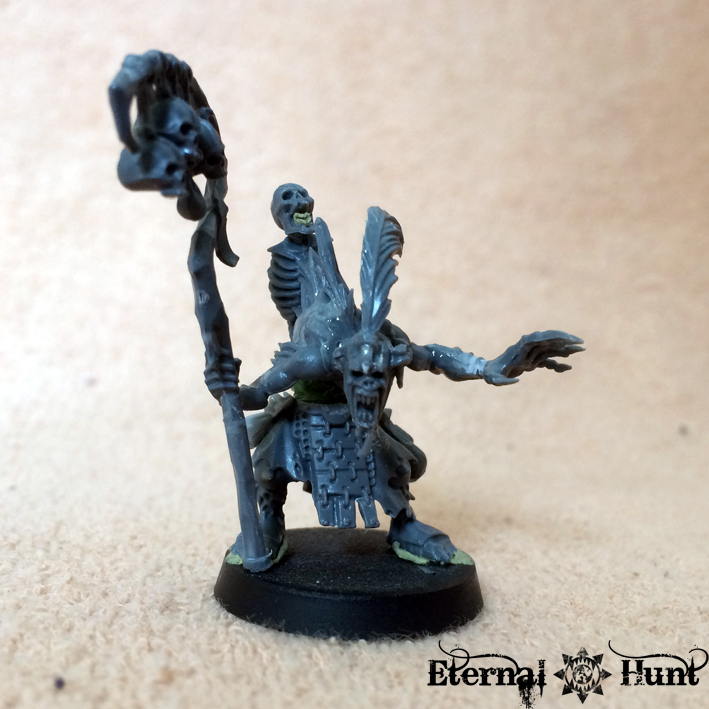 But I think all that I can do is to slowly keep working away at these, completing one model at a time — after all, INQ28 isn’t about huge model counts for me, but rather about tweaking each and every conversion and paintjob until I am happy with them. These are characters, first and foremost, and not merely playing pieces. 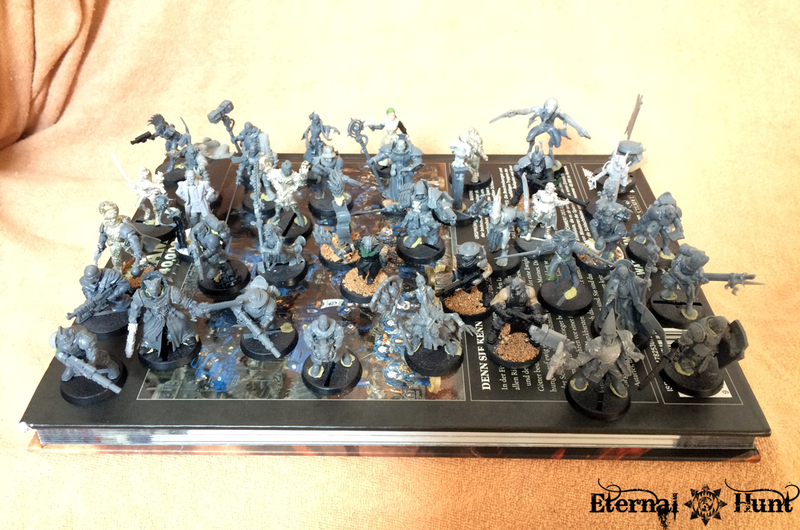 For now, while my productivity may wax and wane, I am still pretty pleased with my INQ28 collection, both when it comes to the painted and unpainted parts. Coming back to these models is always a blast, even if it takes years. And working on a single character until everything just falls into place always feels like a breath of fresh air! The AdMech madness continues, with another sub-faction of creepy machine men and another slew of new plastic kits — after years and years of yearning for AdMech models to make an appearance, with nothing but a lone Enginseer model to tide us over, this is certainly a great time for veteran hobbyists who grew up loving John Blanche’s and Jes Goodwin’s brilliantly creepy AdMech artwork! 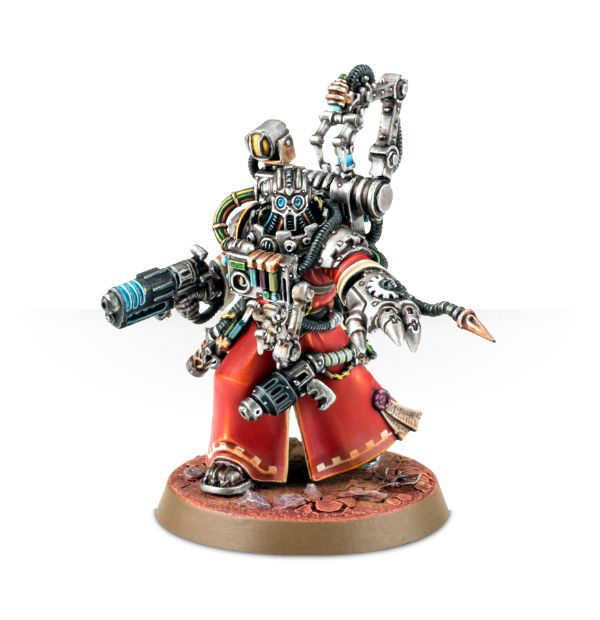 I was slightly disappointed when the Skitarii release didn’t feature an actual Tech-Priest, which made seeing this guy all the sweeter. Seriously, what a fantastic interpretation of a venerable Magos (and imposing battle commander of the Adeptus Mechanicus, no less)! I am in love with this guy! 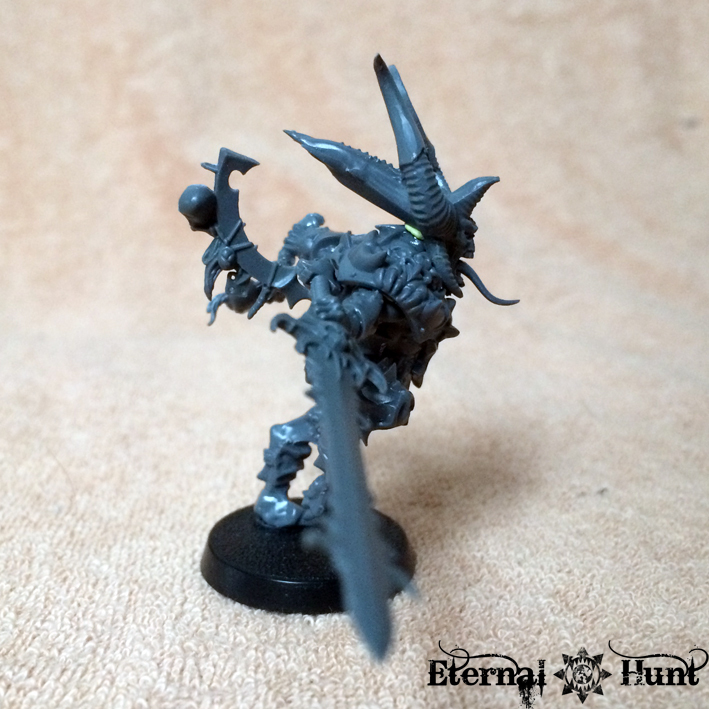 My favourite part about the model is probably how it seems almost impossible to guess what the Tech-Priest would actually look like underneath those robes: He seems like a stooped, but ultimately humanoid figure at first glance, yet those insectile legs hint at something very creepy and inhuman. 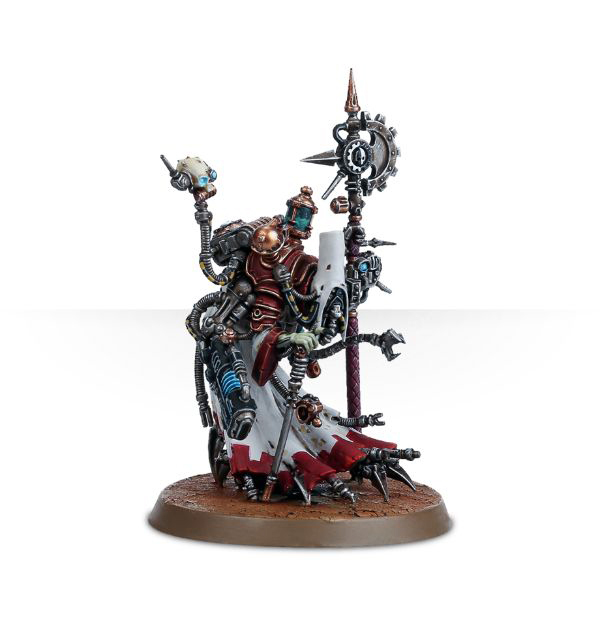 There’s a palpable Warmahordes Cryx influence to the whole design, yet also enough of the established 40k AdMech look to firmly bring it into the 41st millennium. The model is also quite a bit bigger than I had expected, making it tower over most infantry models –maybe that is the one tiny piece of criticism I have: The Tech-Priest Dominus might just be a tad too imposing 😉 A smaller, more frail figure at the centre of all that cyborg firepower could have been an equally interesting idea. But the design remains fantastic! 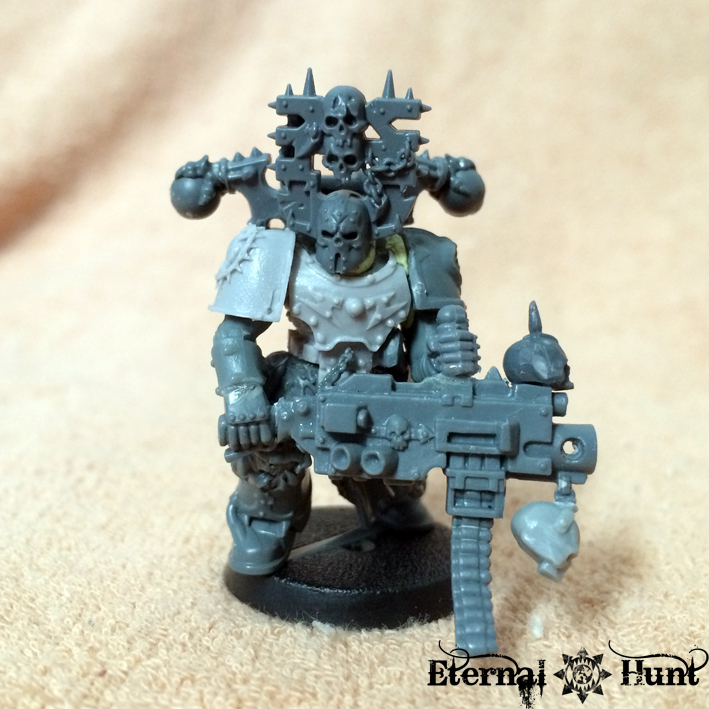 I was also pleasantly surprised by the inclusion of a second head and some additional weapons options! All the options are looking great, and it’s certainly nice to have the option of changing things around a bit when building multiple Domini. 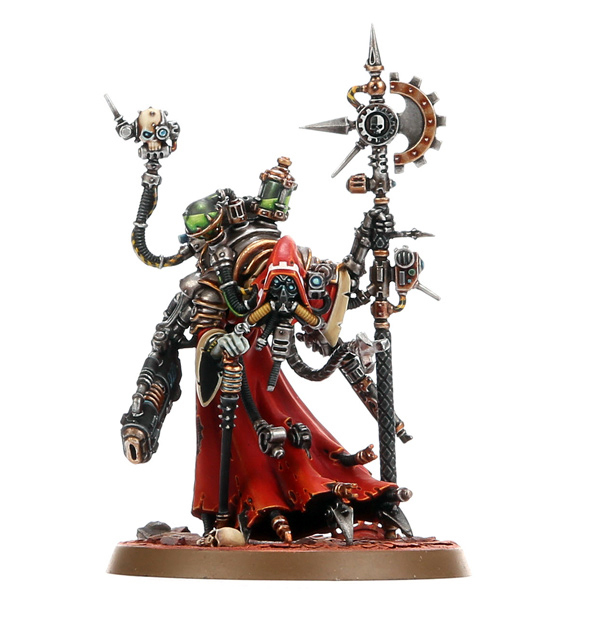 All in all, the Tech-Priest Dominus is an absolutely fantastic model that embodies much of what I have always loved about the Adeptus Mechanicus. 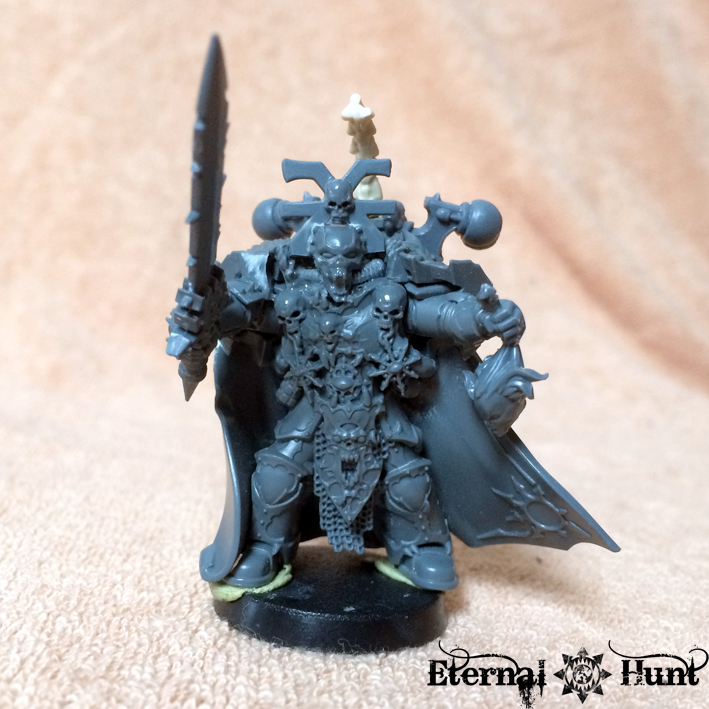 It is also a great army commander, easily measuring up to the various, hulking characters and creatures commanding the other armies of the 41st millennium. A definite high point of this release for me, and one of the models I have already purchased myself. Excellent! The idea behind these robots seems to be that they are relicts from the Dark Age of Technology, merely salvaged and repurposed by the Adeptus Mechanicus. 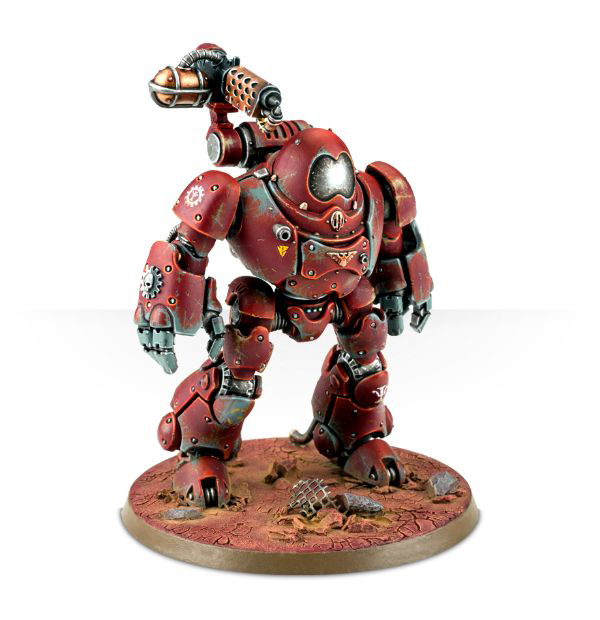 Which is why their look is so very unlike most other 40k warmachines: They have a rounded, slightly minimalist retro 50s SciFi look that seems more at home in Fallout than 40k, at least initially. It is this look, I suppose, that has earned them the scorn of quite a few commenters online. 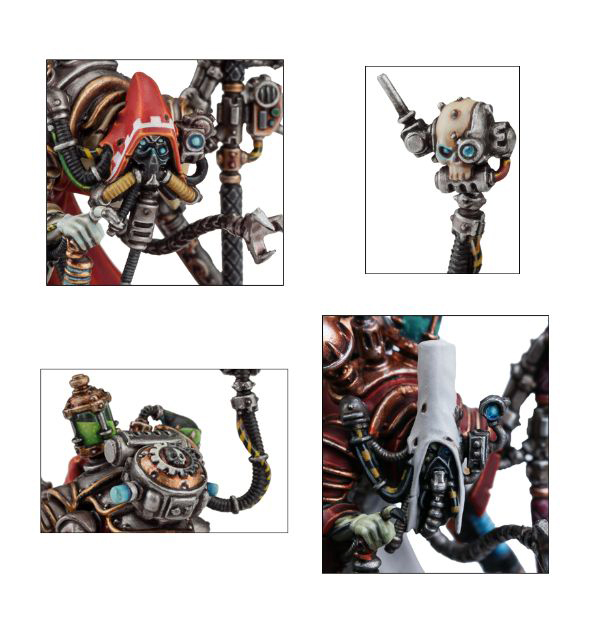 As has been the case with several parts of the Mechanicus releases, these models provide yet another callback to established parts of the lore from way back when, which is something I like very much (on a mostly unrelated note, doesn’t the model in the top left slot really remind you of Forgeworld’s Vorax battle automata…?). 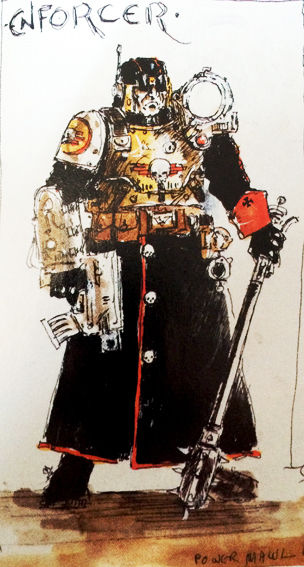 I think it’s great how GW seems to be carefully redesigning and updating certain concepts and visual elements that have been in existence for a long time for the AdMech factions — it seems very fitting, considering the background of the army. 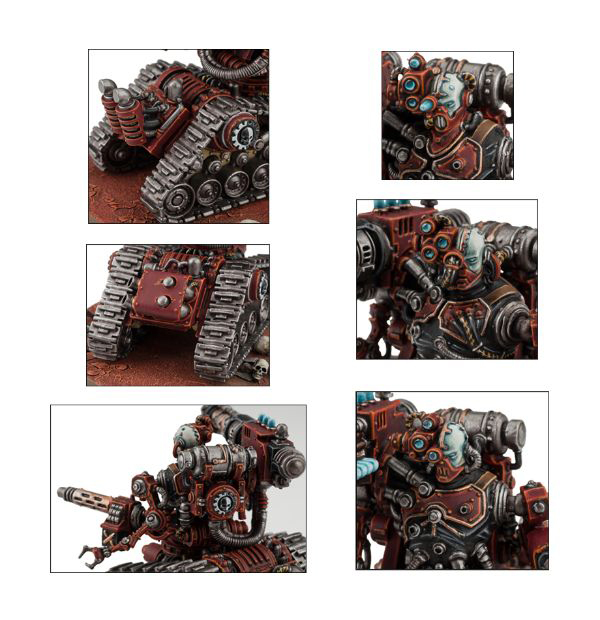 The other thing I find interesting is how the Kastelan shares quite a few visual cues with both the Contemptor and the Mechanicum Thallax: It’s easy to imagine how both machines may have been attempts by the Mechanicum of old to reverse-engineer or evolve the Kastelan template they had salvaged from the clutches of Old Night — a very nice bit of visual storytelling for those who are into such things! The third thing is that the design unequivocally marks the Kastelan as a robot, rather than a cyborg: The domed heads with their empty visors – an element disliked by some – clearly evokes an unthinking, unfeeling machine. It also seems like an invitation to painters to get creative (I wonder why nobody has tried a Fallout-style effect in green yet 😉 ). You know what, though? You can basically pose this guy any way you like! 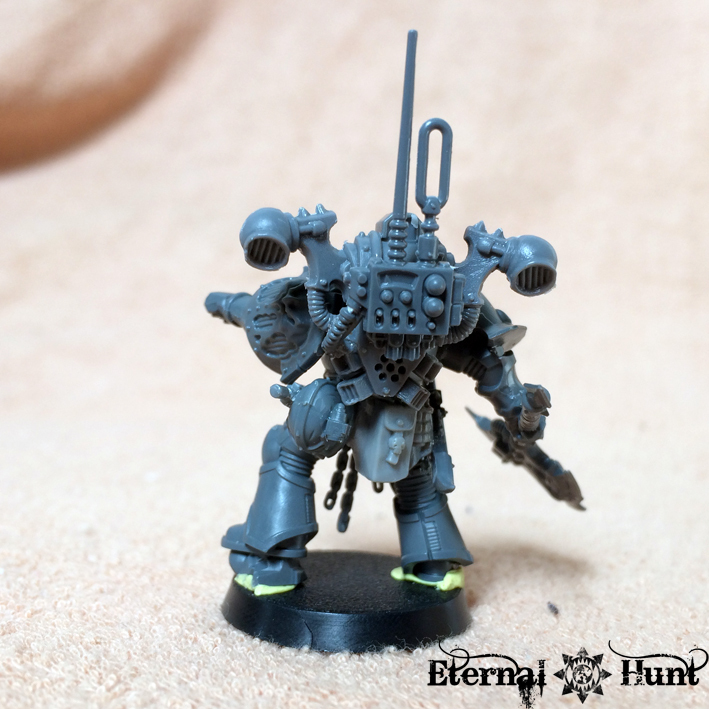 The legs, in particular, are every bit as flexible as those of a Contemptor: You simply cut off the nubs that lock them into place, and different poses (even running or walking) are really easy to achieve. If there is one real shortcoming to the kit, it’s the lack of options: While the model’s pose may be unbelievably flexible, there are actually only very few ways of equipping these guys: the – delightfully Contemptor-esque – power fists or the slightly goofy gauntlets with integrated guns (reminding me of the equally goofy Batman villain KGBeast, for some reason). 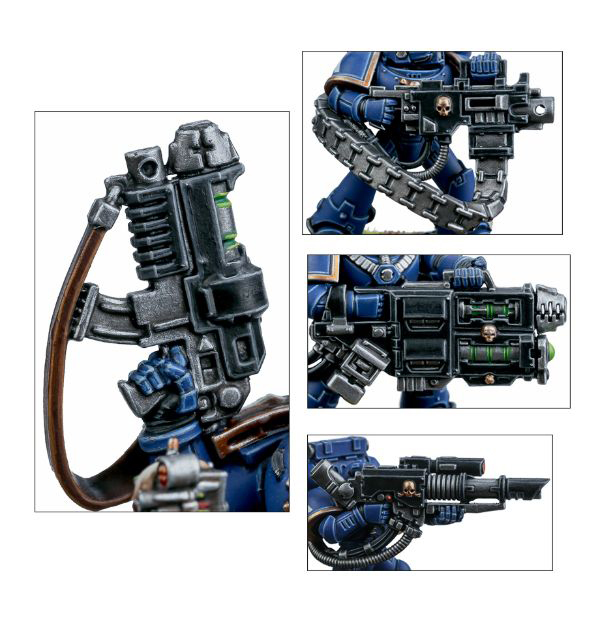 And while the shoulder mounted weapons are a pretty clever shout out to the model’s earlier incarnation, they do seem like a bit of an afterthought, from a visual standpoint. And there’s a personal gripe of mine: The arms are just too short. 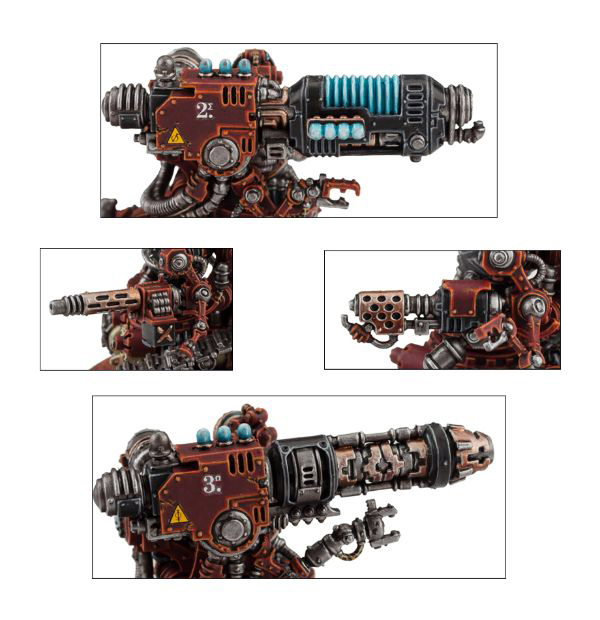 It’s easy to see that this was a deliberate choice on the designers’ part, but it just seems slightly strange that the Kastelan would probably have difficulties hitting anything with its power fists. But wait, it’s not all about the robots! 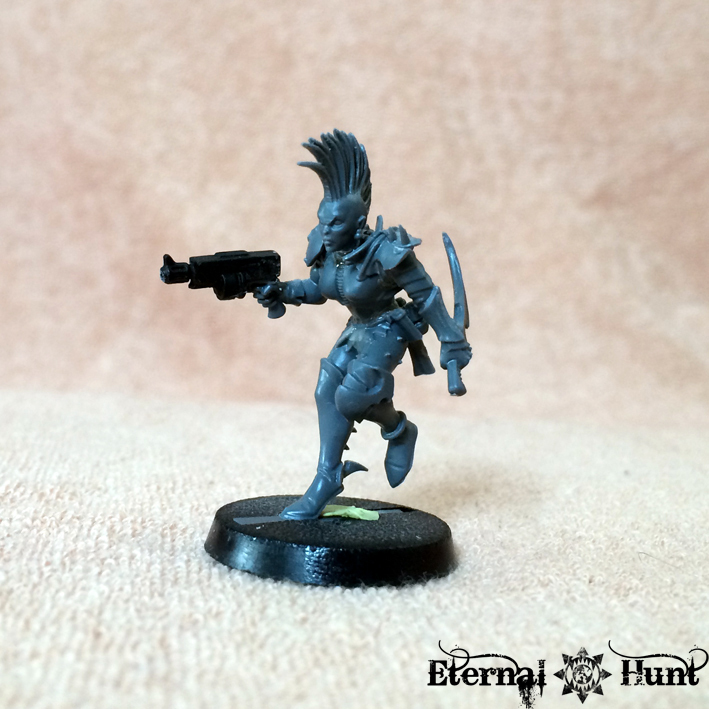 In addition to the two Kastelan models, we also get a Datasmith as part of the deal! 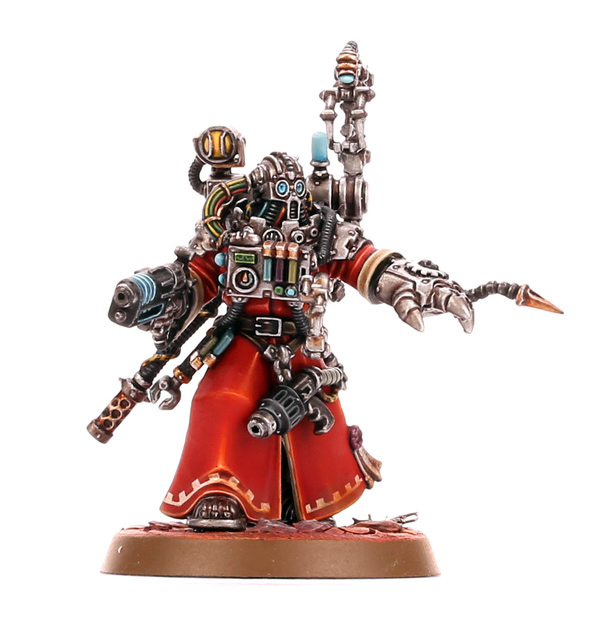 I really love this guy for a number of reasons: He’s instantly recognisable as a Tech-Priest, for one, but there are also several interesting things about him: He’s more massive and imposing than your average, hunched over Magos. He’s pretty heavily armed. 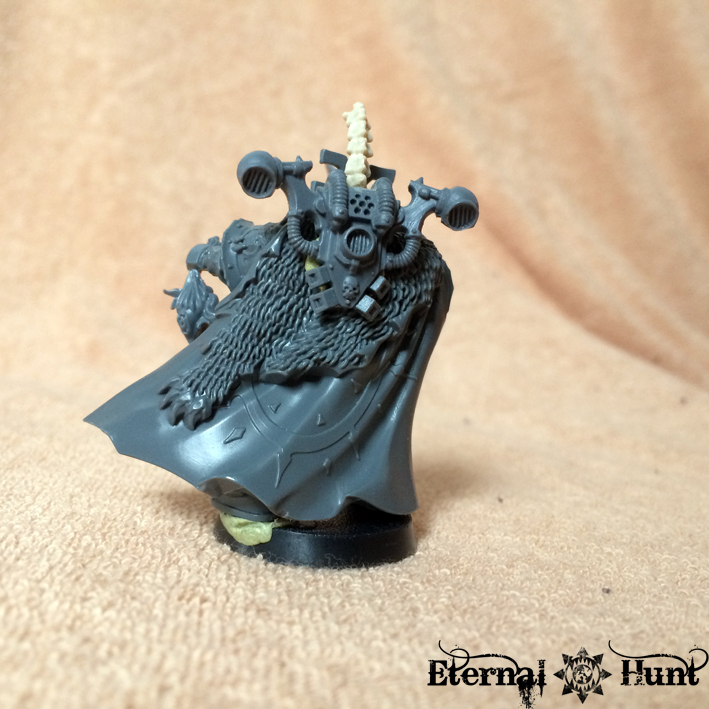 And while he has the robes, his heavily augmented head remains uncovered, giving him a rather distinct look. And you’ve got to respect the amount of thought that must have gone into the array of servo-arms designed to slot his datacards into the Kastelan robots on the fly. But what is possibly my favourite thing about the Datasmith is how the model seems like a reunion with a long-lost friend. Come on, guys, doesn’t he remind you of someone…? 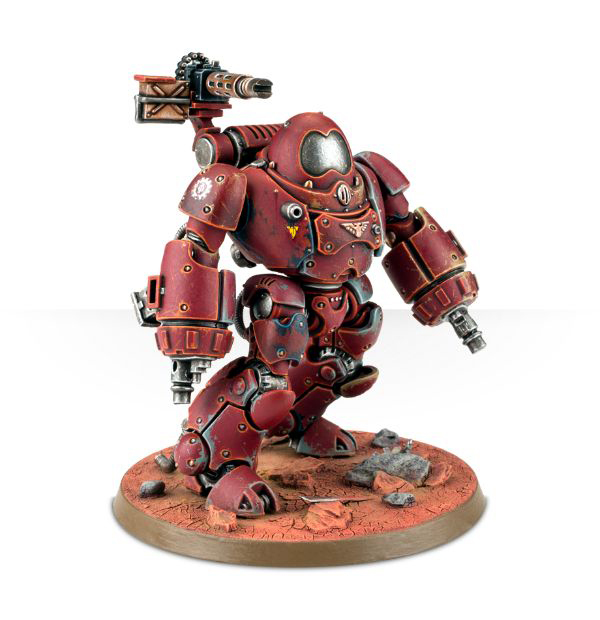 While the Kastelan Robots didn’t meet unanimous enthusiasm within the 40k crowd, I think we can safely say that this is a kit that many hobbyists have been waiting for, seeing how Praetorian servitors with track units for lower bodies have been a long-established part of AdMech lore. Personally speaking, the concept has never resonated all that strongly with me, but that’s probably just a matter of personal taste — so yeah, here we go: tracked servitors. Good job, GW! 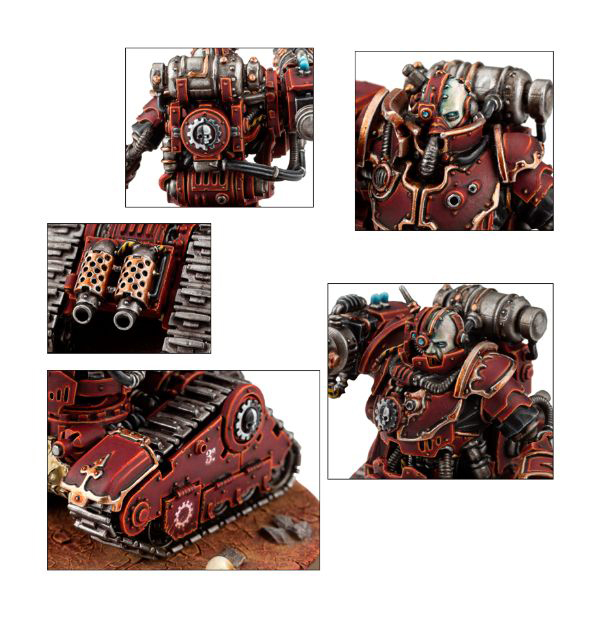 Seriously, though: The designers certainly delivered on the concept, providing us with yet another spectactularly detailed multi-kit that allows us to build one of two kinds of Kataphron servitors. Let’s look at each of them in turn: First up, the Kataphron Destroyers, which basically work as mobile weapon platforms: While both variants of the kit use the same general template of a humanoid torso grafted to a track unit, the design seems to work slightly less well on the Destroyers, because the models seem less human, due to the spindly arms and crude augmentations. I am pretty sure that this effect is entirely deliberate, although the resulting model just seems a tad ill-proportioned to me. All in all, however, this particular setup doesn’t really agree with me: It just looks slightly too haphazard and hokey for my taste. Once again, the detailing on each part of the models is something to behold. 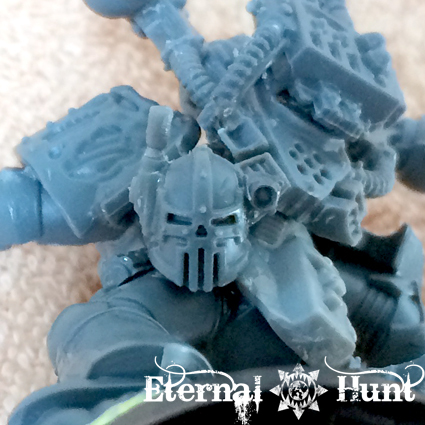 And I just love those upper bodies with just the slightest bit of organic face peering out from all that armour. Brilliantly creepy! 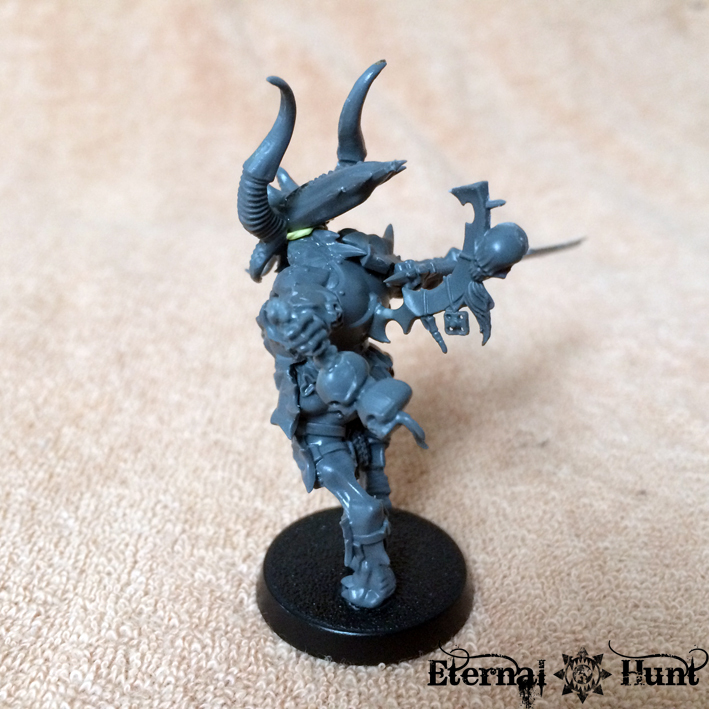 When the first, fuzzy pictures of the two kinds of Electro Priests emerged, I wasn’t sold: In these washed out leaked pictures, they looked like crude kitbashes made from Dark Eldar Wracks and the robed legs from the old Dark Angels Veterans. 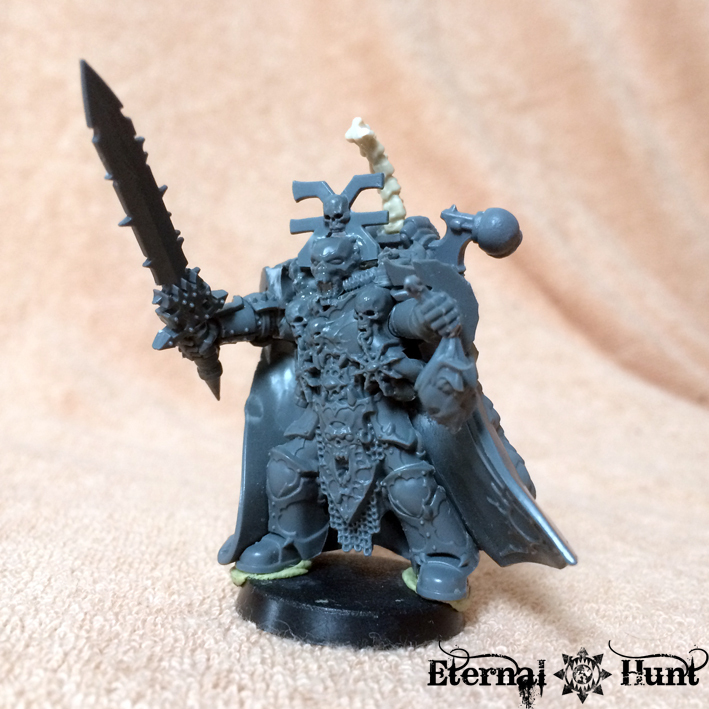 Fortunately enough, the finished models have ended up looking far more convincing, and they also use another vintage character concept that I remember from my happy days of reading the 2nd edition Codex Imperialis. Yay! 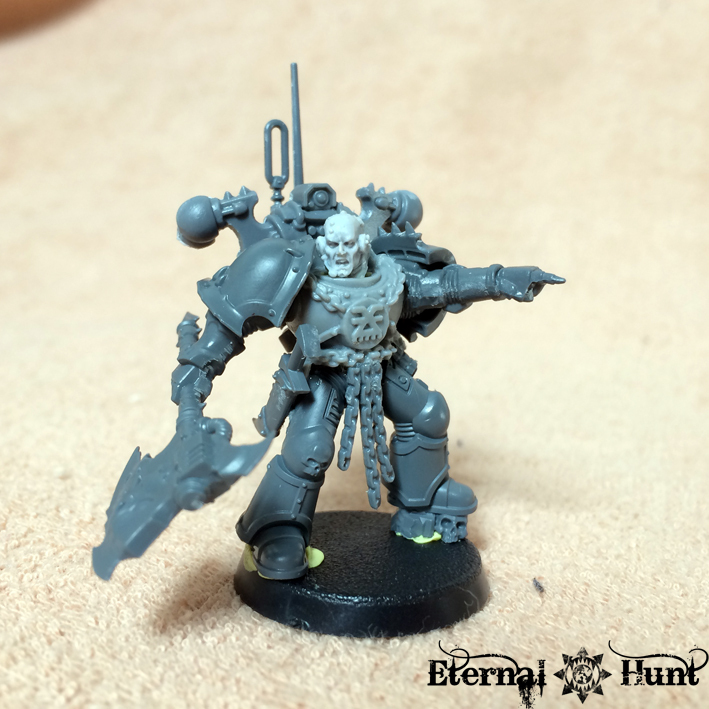 It’s great how both variants of the kit work with some of the elements established in the lore so long ago: The burnt-out eyes and electoos, for exaple. 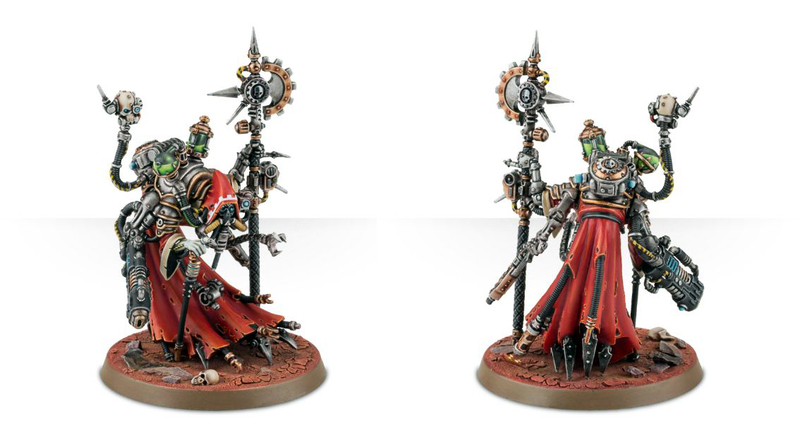 The contrast between the bare upper bodies and robed legs also add a monkish look to the models — almost like the 40k, AdMech version of flagellants, which is a great idea and produces a squad with a very distinctive look amongst all the mechanoid monstrosities. This gives the impression of individuals very crudely reshaped into organic lightning rods: Their equipment is so cumbersome and eclectic that you’ve really got to love it! At the same time, the cluster of coils around their heads also works as a kind of halo, adding a nice twist to their monkish, priestly look and turning them into living angels of electricity, so to speak. There’s something wonderful about the contrast between the organic, flowing lines of the bodies and the crude, invasive augmetics and cables, making these guys very interesting to look at. Very cool! They are still pretty cool, make no mistake, but the weapons result in a kind of “SciFi-Shaolin” look that seems slightly less interesting than the Steampunk vibe the Corpuscarii have going on. 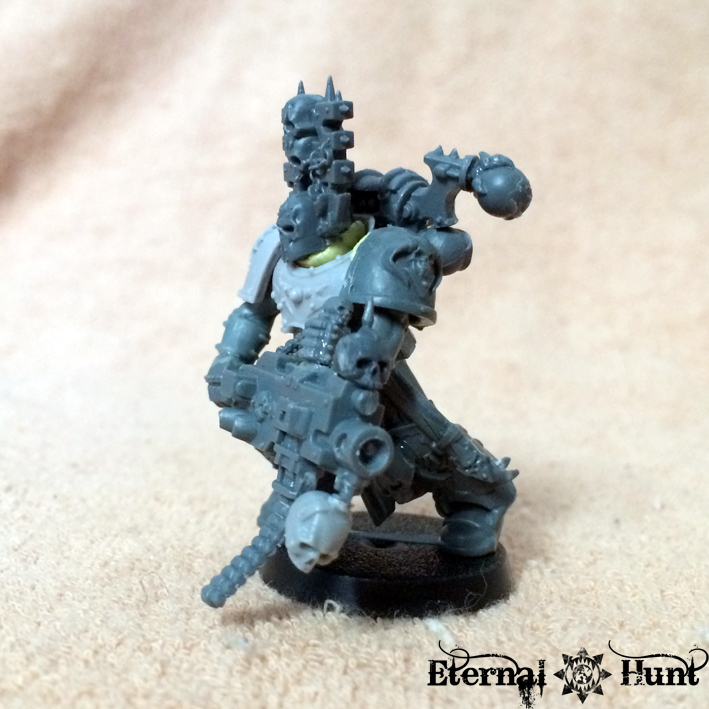 What I love about these models is how they bring something very new and distinct to the AdMech catalogue: I a collection of models that is mostly characterised by monstrous cyborgs or utterly inhuman machine soldiers, these guys make for a very interesting and grimdark contrast, which is great. I can also imagine they’ll be very popular with the converters. All in all, a very cool kit giving us one outstanding and one slightly less interesting, yet still fairly cool, type of infantry. 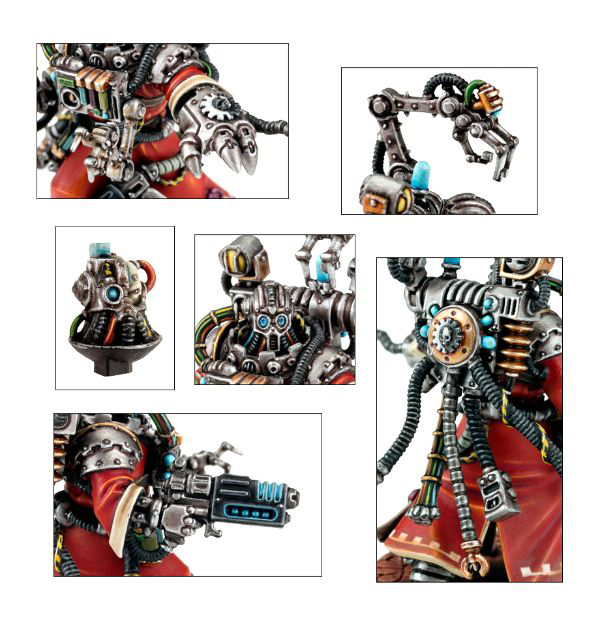 First of all, it should be mentioned that all of these kits would be just as great for a Dark Mechanicus army, obviously. 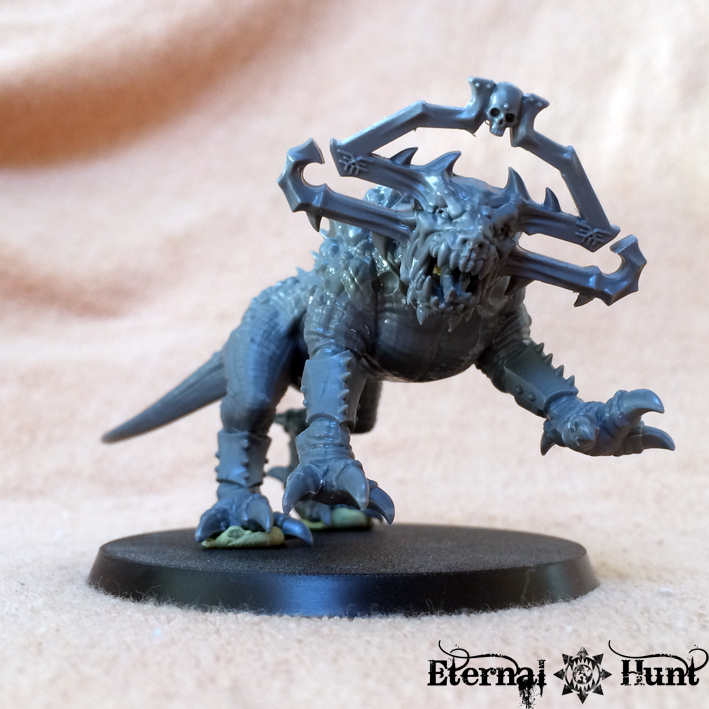 They are already pretty disturbing and sinister as it is, and I think it would be a lot of fun to take them even further via an influx of chaos, Dark Eldar and Skaven bitz. 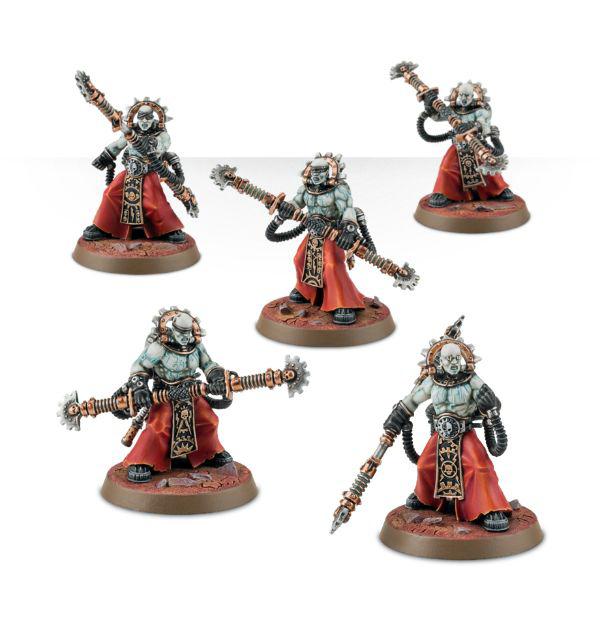 The Cult Mechanicus models are arguably even better suited to this fate than the Skitarii, seeing how many of them are more grimdark and less clean and stylised than the Skitarii kits. The other big winners of this release are the INQ28 aficionados, once again. 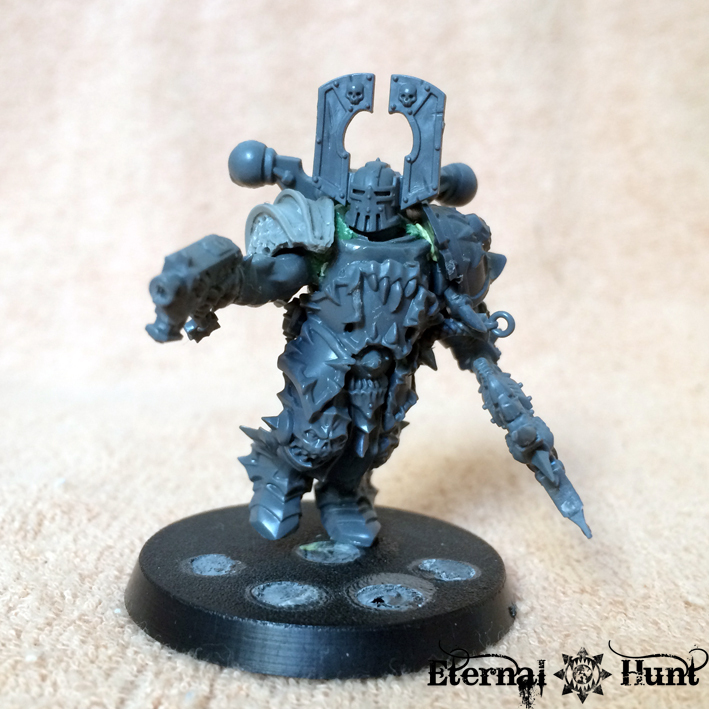 While it’s true that an enterprising INQ28 fan can use almost anything for a conversion project, it’s great to finally have so many options for building AdMech characters and their disturbing creations for our own warbands and retinues. 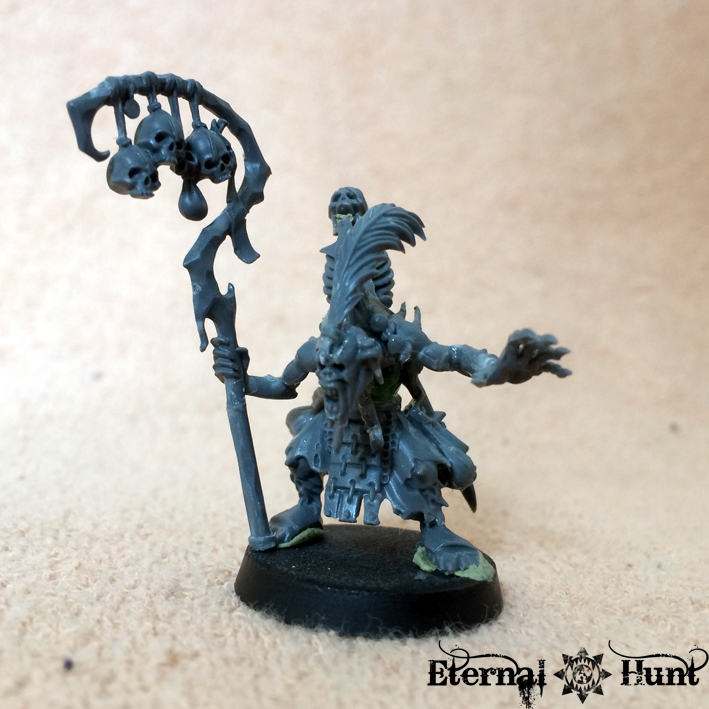 This model initially seems pretty complicated to convert, yet one need look no further than Omegon’s excellent conversion of the model to see that it’s fairly easy to make an already rather disturbing stock model about 100% creepier! I think we can look forward to many people tackling conversions of this particular model, especially when it comes to INQ28. 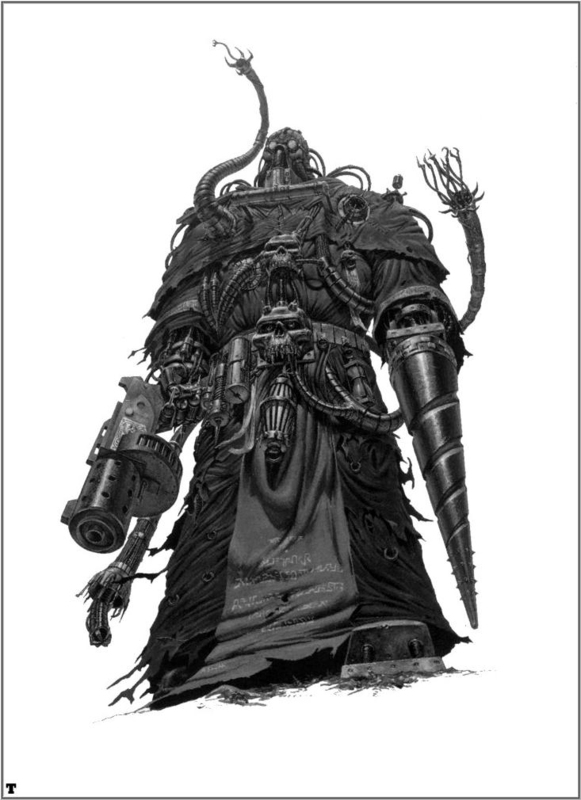 Beyond the confines of the Adeptus Mechanicus, I also think the Dominus would work really well as an alternate Chaos Lord or Warpsmith! 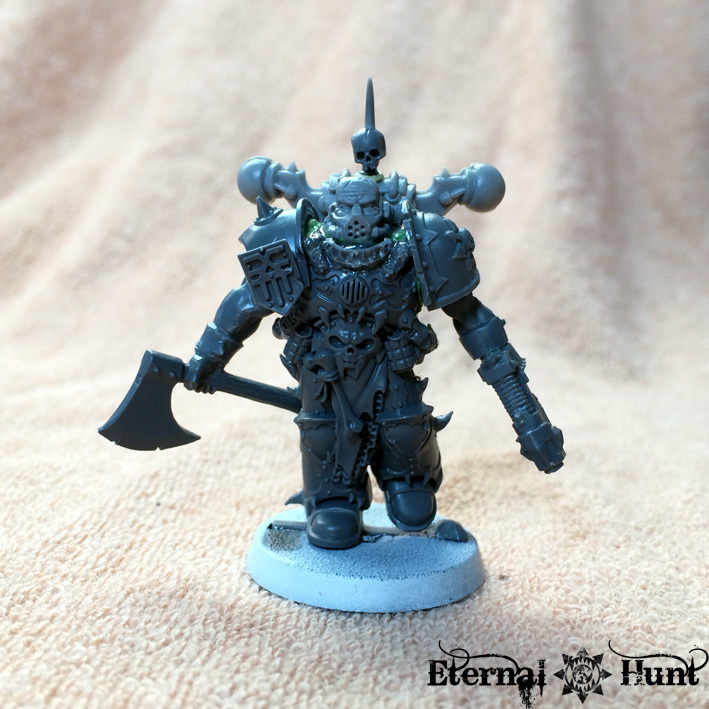 as recently suggested by TJ Atwell, they could work really well as counts as Contemptors or as a possible base model for converting your own plastic Contemptor. 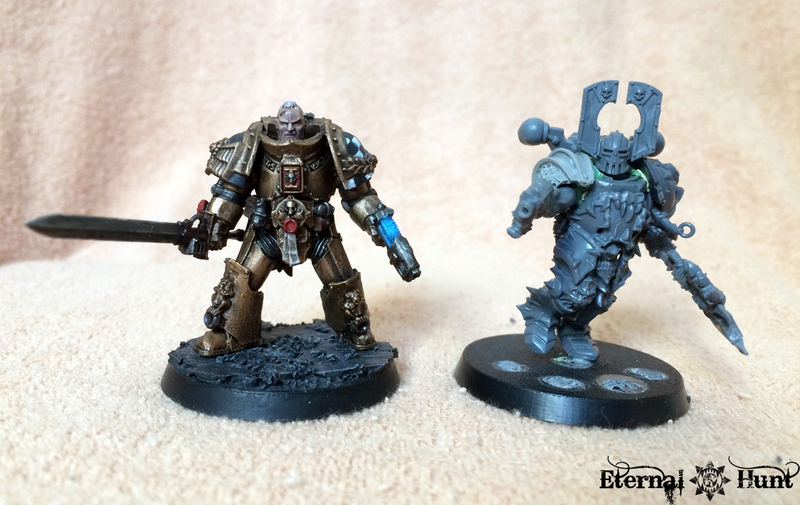 These comparison shots – kindly provided by Kilofix – shows the models are reasonably close in size, so it would definitely work. If you don’t feel up to the task of making a full-fledged Contemptor out of them, that’s fine too! 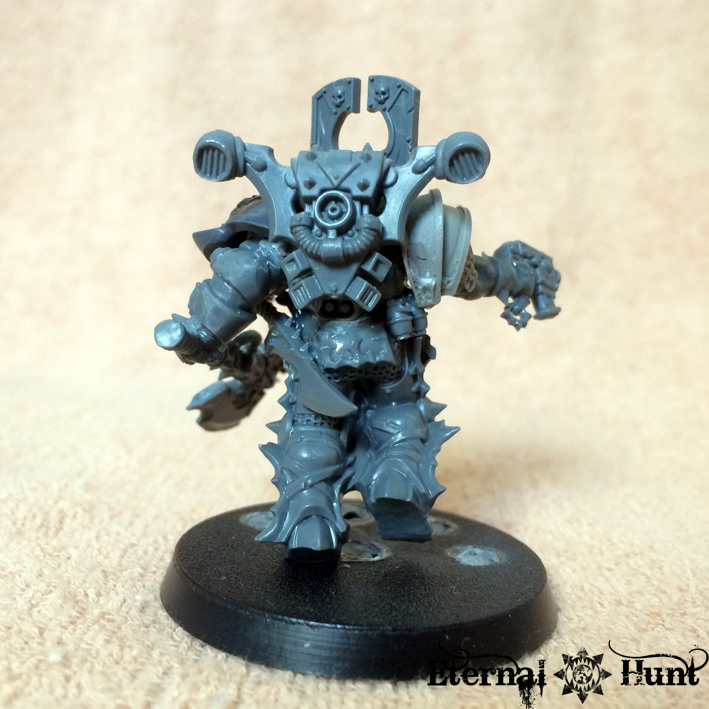 Why not use them as alternate Dreadnoughts or Helbrutes (Alpha Brute, anyone…?) or something a little more exotic — such as Shibboleth’s fantastic Penitent Engines? 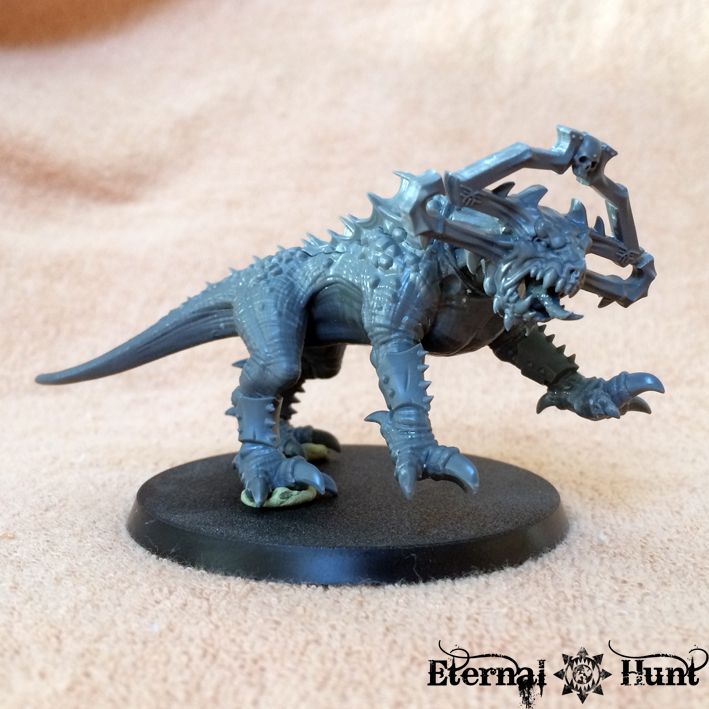 But maybe you need not even go that far: For those of you merely slightly unhappy with the design, particularly with the heads, it can be really easy to change the look of the models with a few small tweaks. 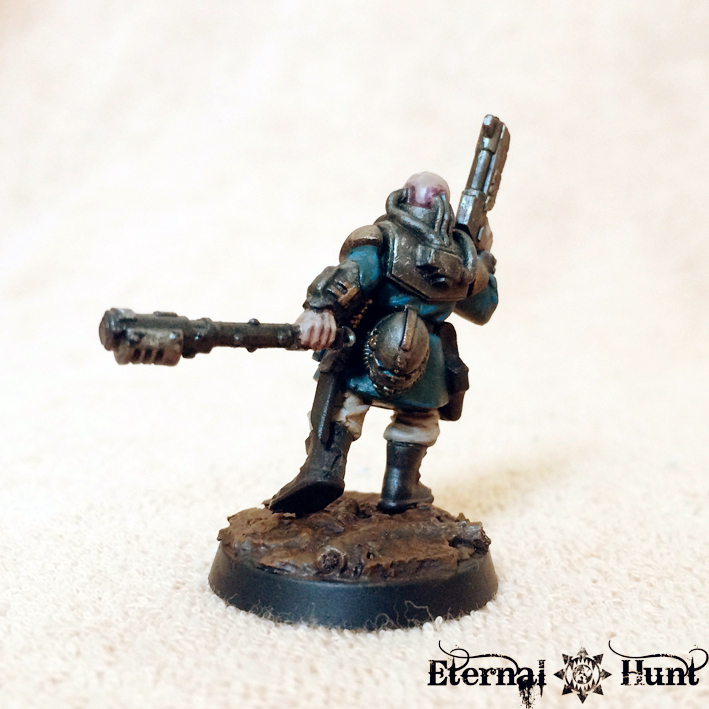 Just check out Andreas Kentorp’s excellent Kastelan to see what can be achieved with just some small changes (and a gorgeous paintjob, of course). 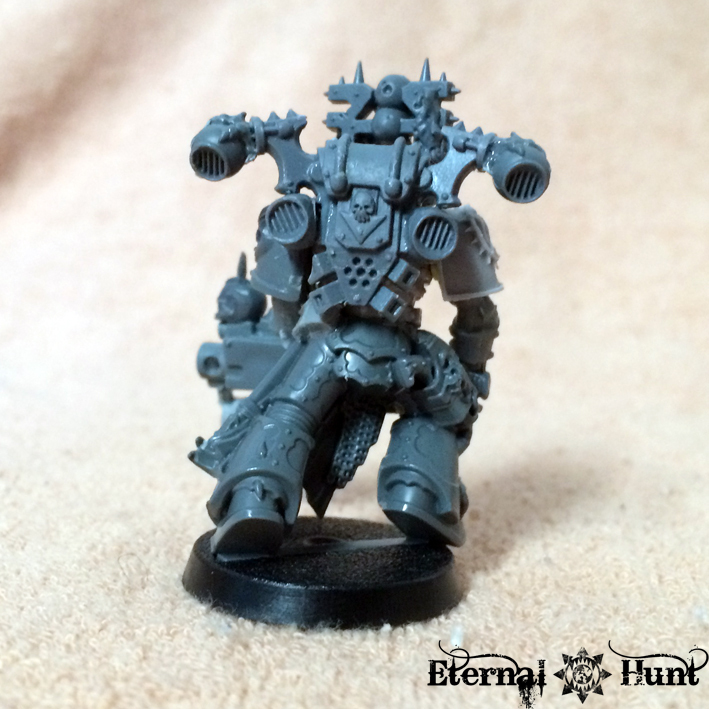 He can obviously be used as a very cool Tech-Priest character for INQ28. 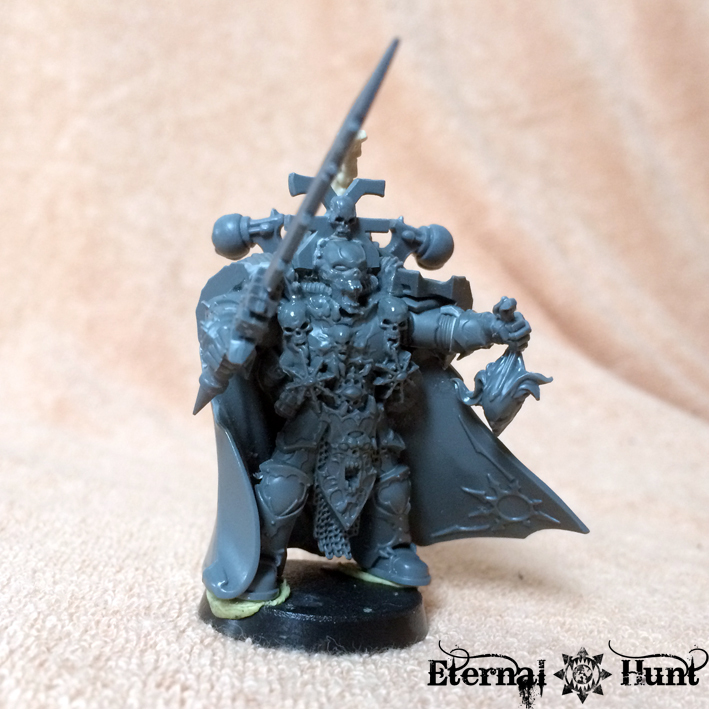 Seeing how similar he is to both Delphan Gruss and that FFG illustration shown further up in this post, I think I’ll make him into a Magos Explorator, for instance. 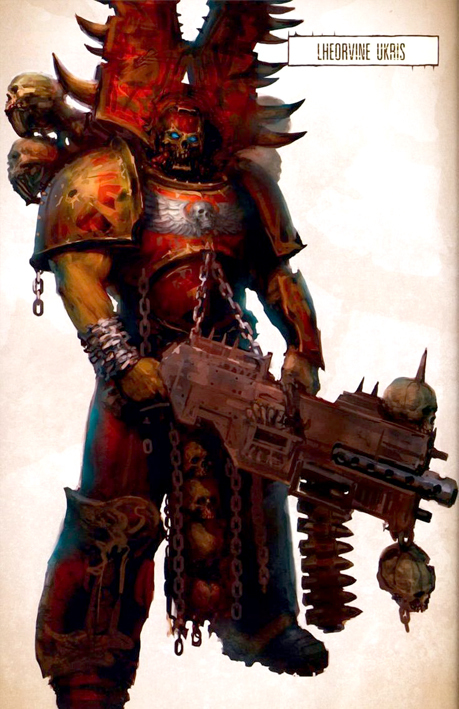 But it doesn’t stop there: The fact that he’s scaled very similarly to a Space Marine, he would make for a fantastic base model when converting a Tech Marine, Master of the Forge, Iron Hands Officer, Warpsmith, Iron Warriors Commander or what have you — some additional bitz and you’re there! 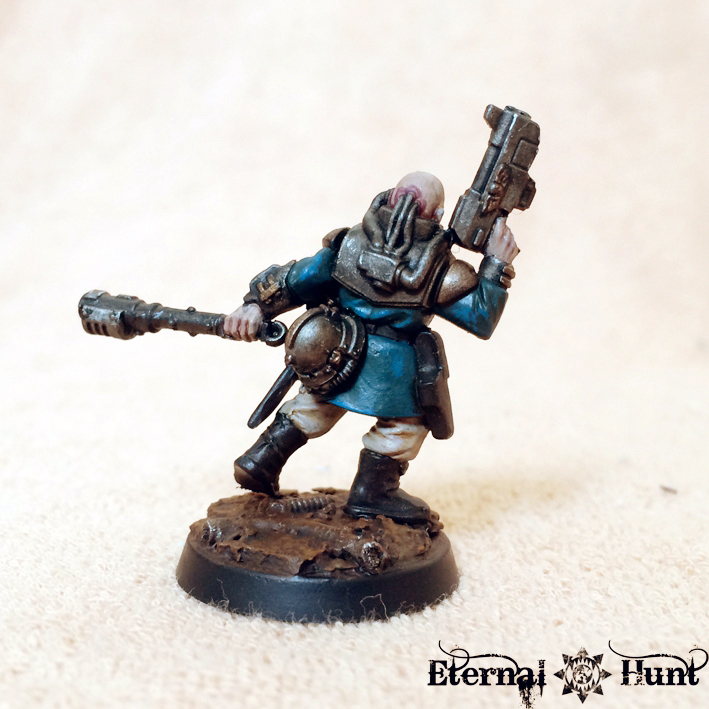 and there’s always the option of using him as an alternate Enginseer model in your Astra Militarum army. 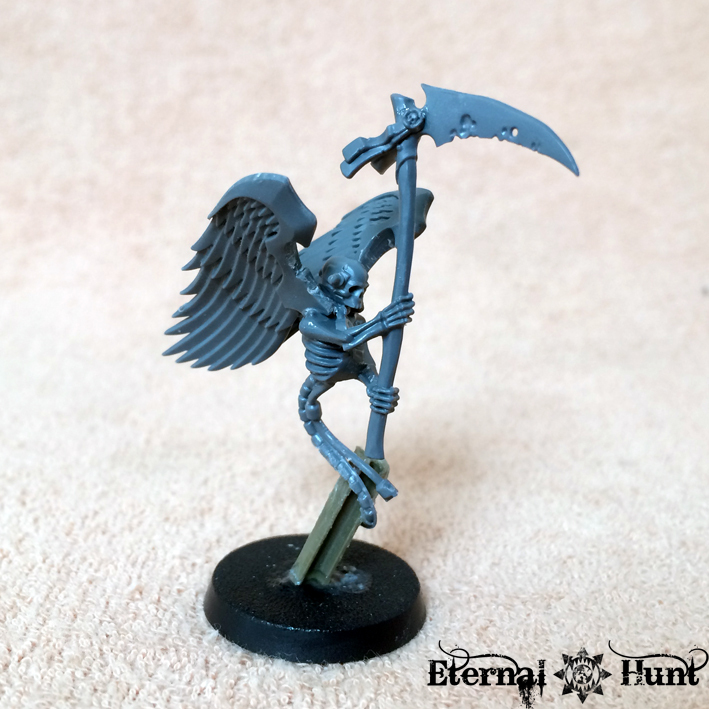 Another kit that should lend itself really well to conversions, since each part of the model could be used for something different. 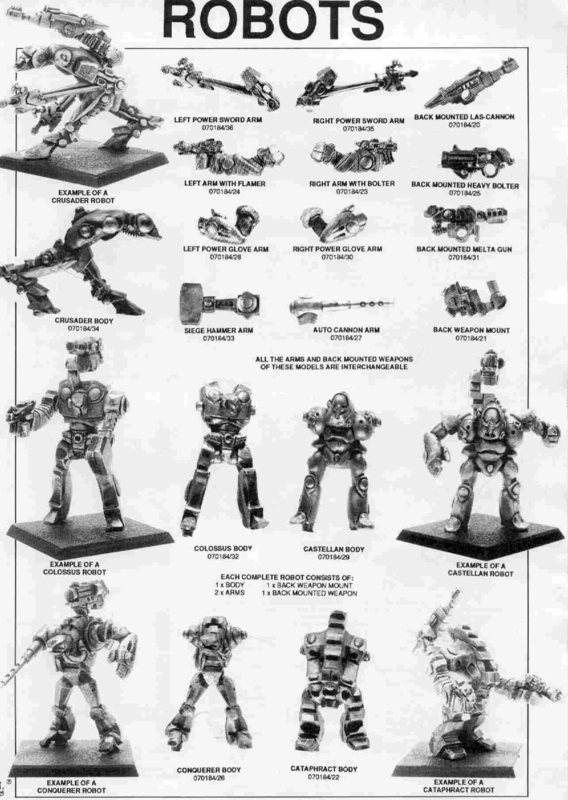 Or you could just keep them mostly as they are and use them as alternate (Iron Hands) Centurions — or Obliterators for your CSM army, in case you still haven’t found an option for representing Obliterators that you are happy with. 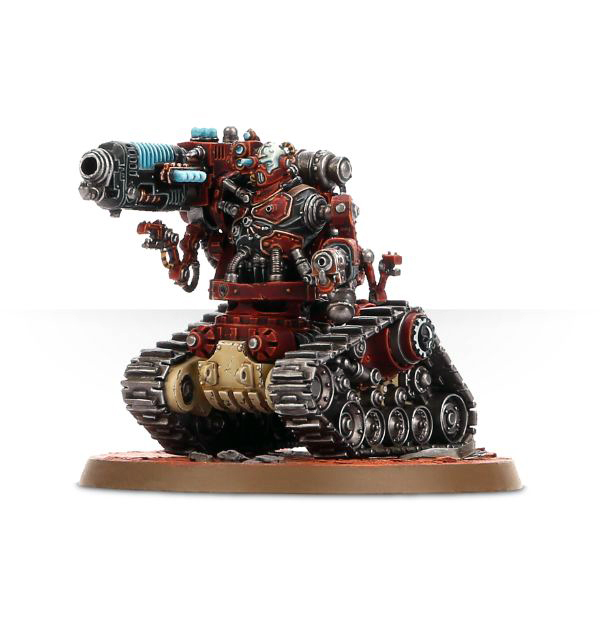 using a Kataphron as a base model for an Iron Warriors Lord or even Daemon Prince? 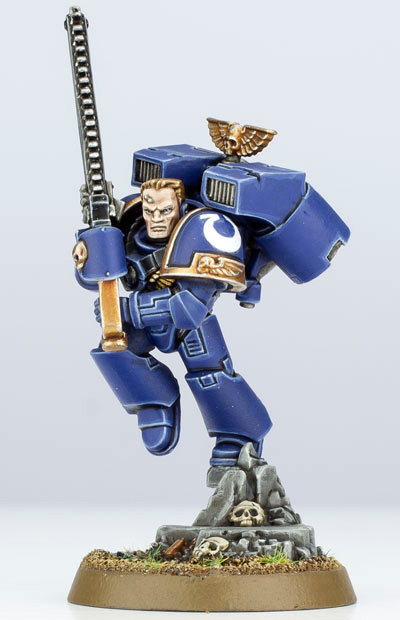 using the upper bodies on top of Terminator legs? 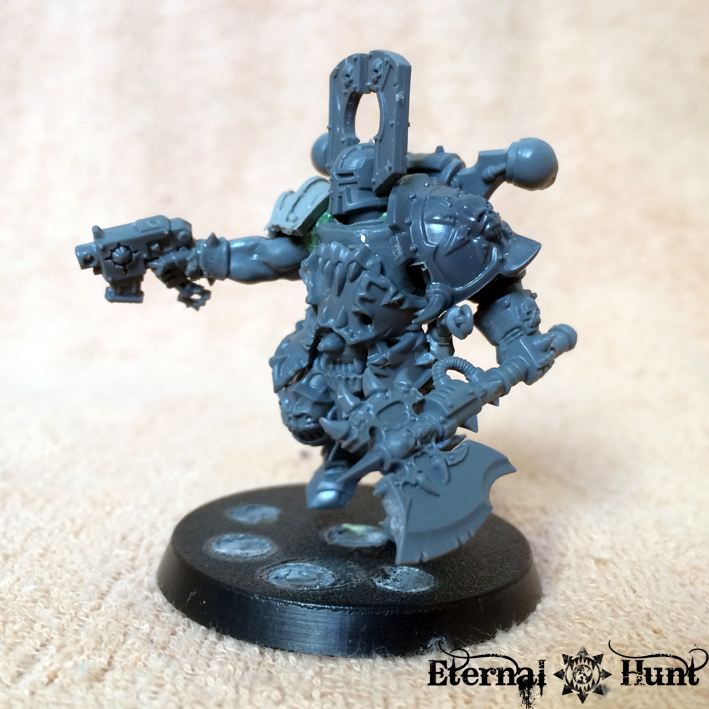 This should work pretty well, and you could end up with pretty brilliant true scale Iron Hands, Iron Warriors, bipedal Skitarii battle servitors, particularly imposing Necromunda Pitslaves or similarly augmented warriors. 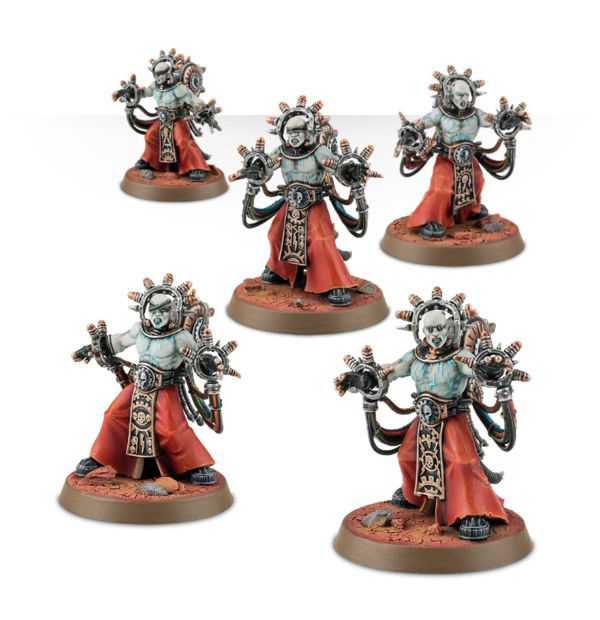 one of these as a penitent psyker or augmented warrior in a radical Inquisitor’s retinue would probably look pretty cool! 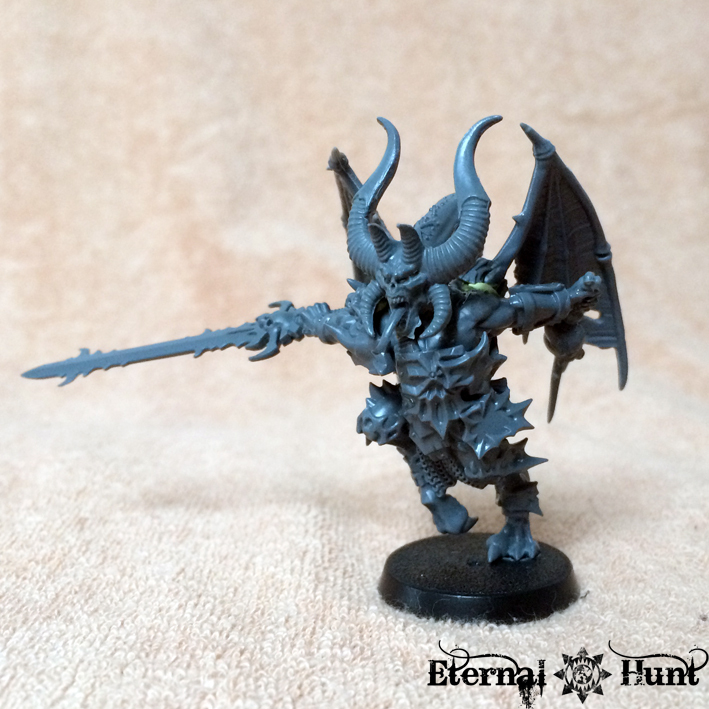 …and the options for chaos are basically endless: tainted psykers? 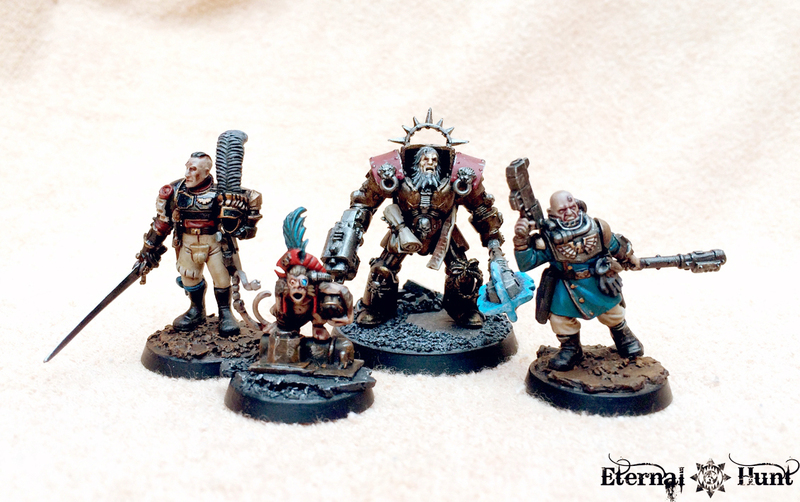 Dark Mechanicus cultists? 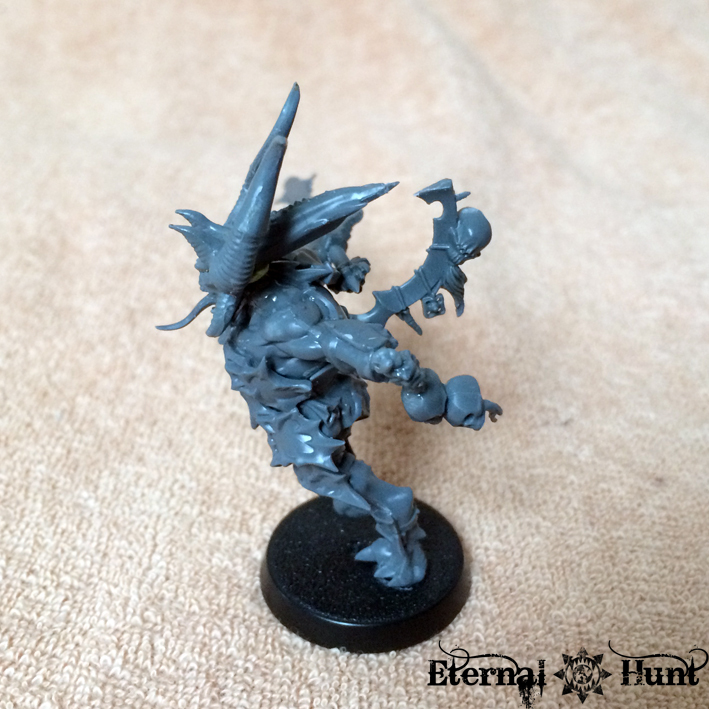 Kitbashes involving the gribbly bitz from the Dark Eldar wracks and/or gas mask heads from the snap fit cultists? The world’s your oyster here! Oh, and one final thing: If you haven’t already done so, you should definitely check out John Blanche’s own, recent AdMech warband. Either via the brilliant photo feature in this month’s issue of Warhammer:Visions or by browsing through this thread over at the Ammobunker. 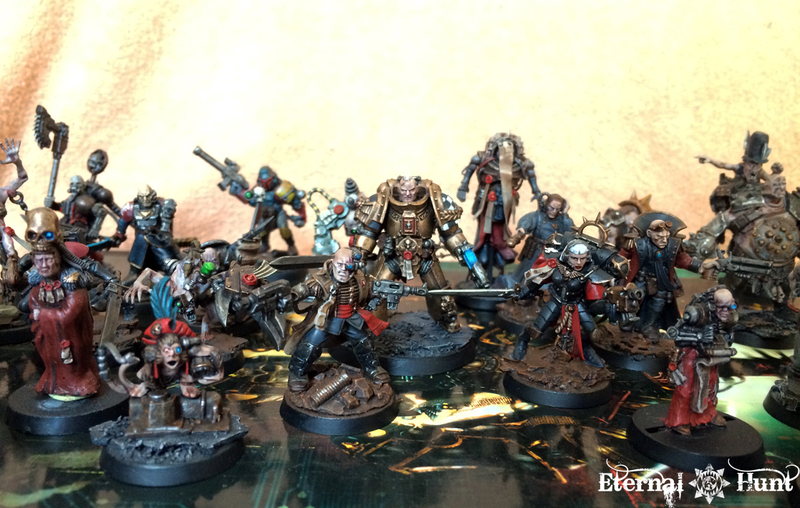 John not only showcases the versatility of the new kits, but also ends up with a truly spectacular and unbelievably grimdark collection of models, as should be expected from one of the fathers of 40k! So what about the release on the whole? 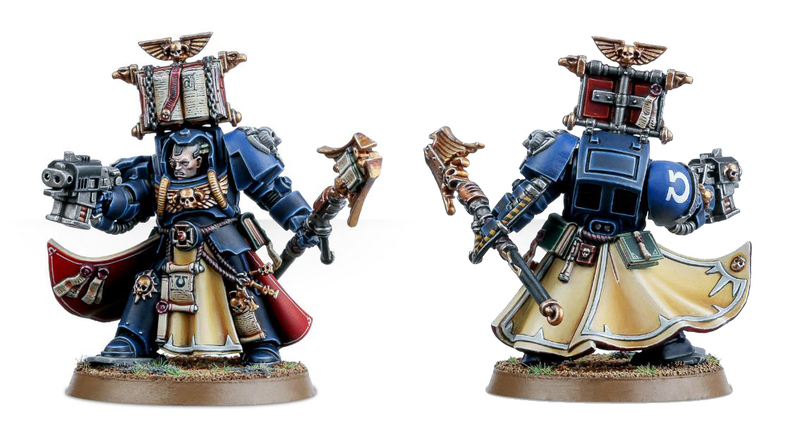 While I am prepared to call this a very strong offering, I cannot help feeling the Skitarii may have been the slightly better release of the two. 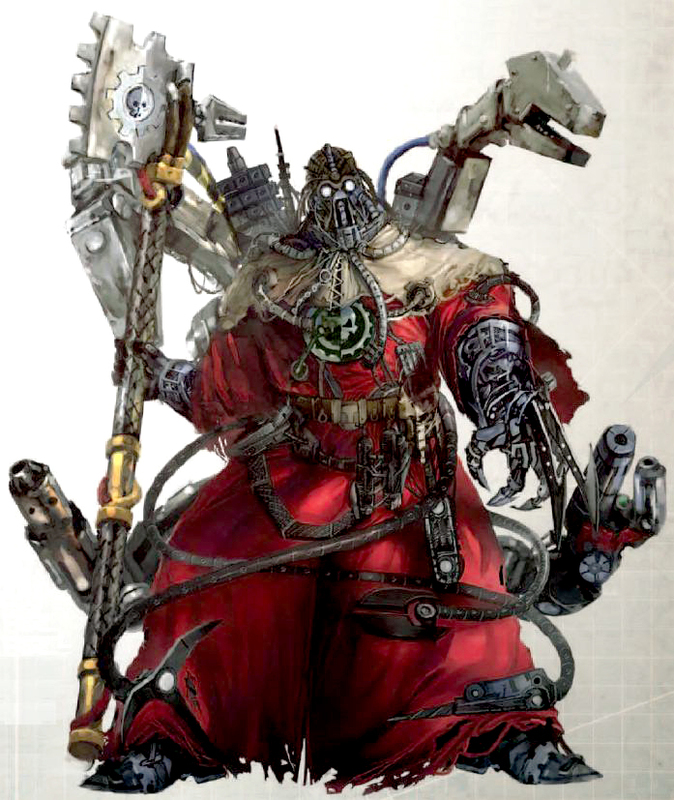 Sure, the Cult Mechanicus is more eclectic and disturbing, yet at the cost of some divisive design decisions. The Skitarii, on the other hand, played it a bit safer, yet ended up the more even, consistently great release. At least in my book. However, such considerations are ultimately moot, of course, because these two releases should definitely be seen as one, overarching faction: After all, the division between the two sub-factions still seems pretty artificial to me. 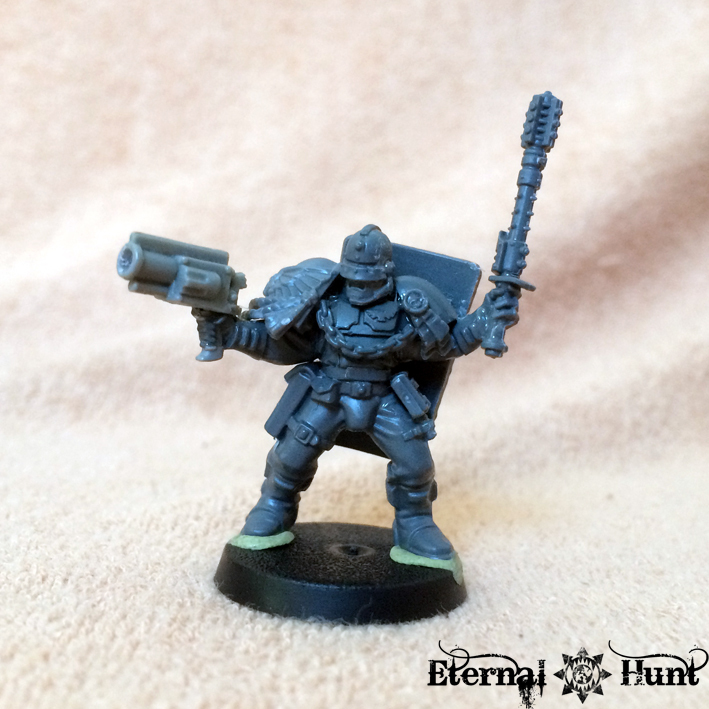 Maybe this is just the way GW would like us to think about armies from now on: as multiple, smaller sub-factions that can be freely allied to each other, rather than monolithic blocks? 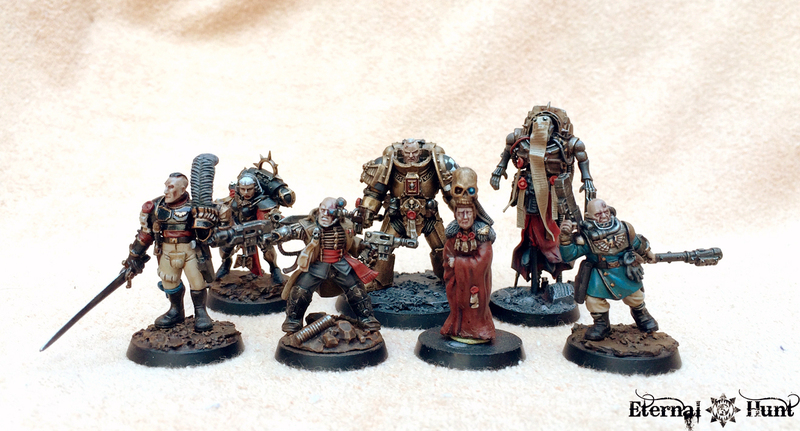 If considered as a bigger whole, the combined Adeptus Mechanicus faction is certainly one of the most spectacular armies available right now, easily on par with the redesigned Dark Eldar. 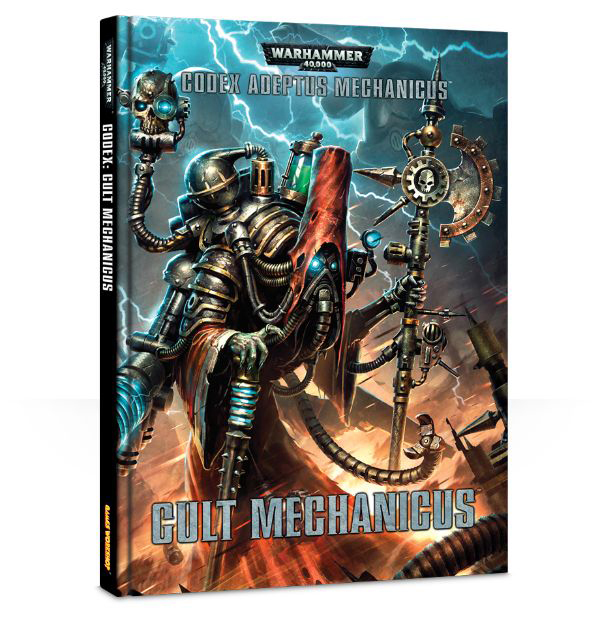 And that’s without talking about the extra options you get by adding the Forgeworld Mechanicum catalogue! Speaking of which, I actually prefer the plastic 40k models over Forgeworld’s offerings in this particular case: The kits are eclectic and versatile, and really cutting edge when it comes to the detail level and sculpt, whereas the Forgeworld Mechanicum models have mostly left me cold so far, with the exception of one or two kits. 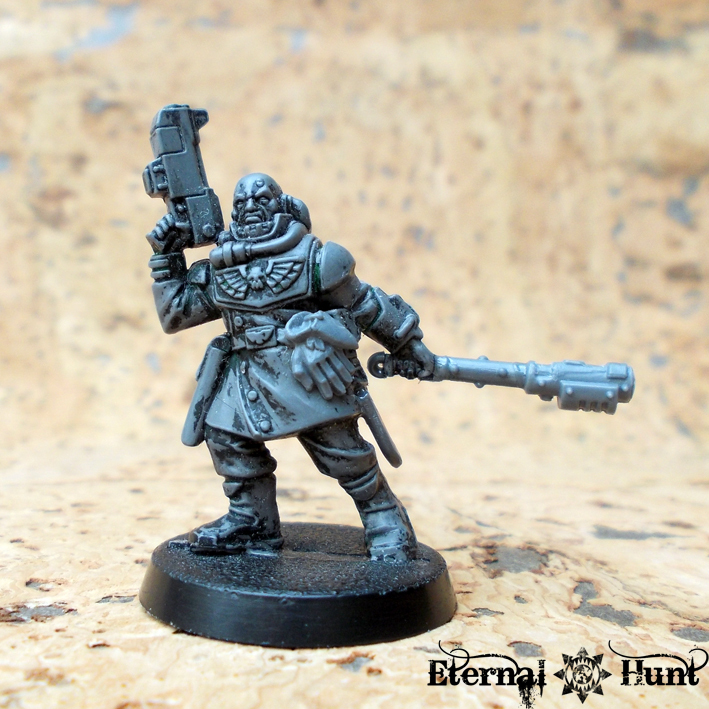 Another thing that I really love about the whole Mechanicus faction is how the new models manage to serve as shout outs and callbacks to pieces of art and character concepts we have known for years – or, in some cases, decades – while managing to turn it all into one coherent army (or two coherent armies that can be allied, to be exact). This makes the Skitarii and Cult Mechanicus an enormous bit of fanservice towards long time fans of the grimdark 41st millennium — at least that’s what it feels like to me. 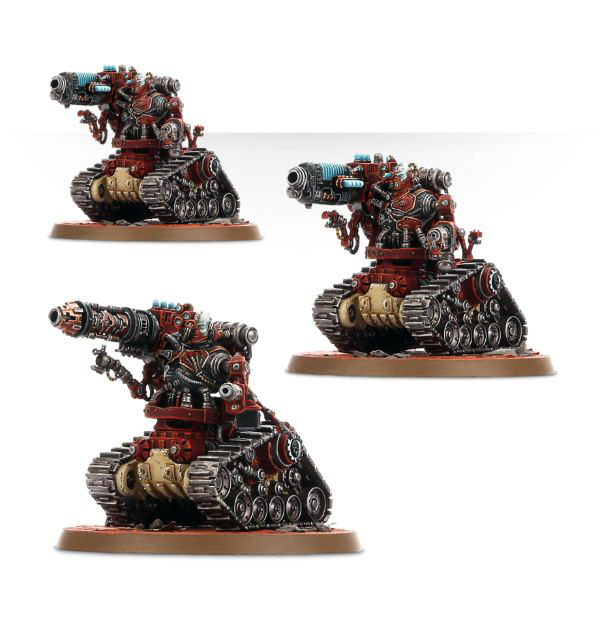 So is there nothing negative about the AdMech models? Well, one thing: Modeler and painter extraordinaire Jeff Vader recently leveled one particular criticism at this release, and it is one I share wholeheartedly: For all the brilliant new kits, GW didn’t nearly do enough with the Tech-Priests themselves: It would have been awesome to be able to build Magi of different shapes and sizes with all kinds of bizarre augmentations. As it stands, enterprising converters will still be able to make it happen via the bitz provided by the release, and it is certainly something I will attempt myself when I inevitable build an AdMech retinue for INQ28, but actually having this reflected in the release would have been the icing on the cake. 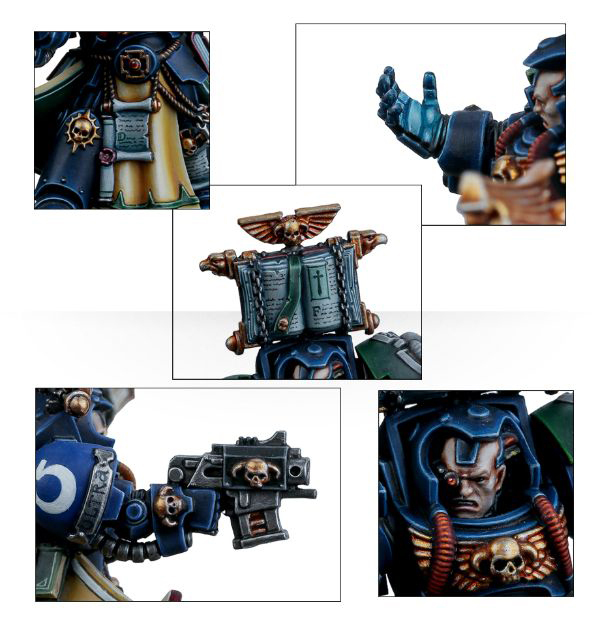 In spite of that, we have a spectacular new faction for 40k and some brilliant new kits to play around with, and it feels like it’s been worth the wait. But what do you think? 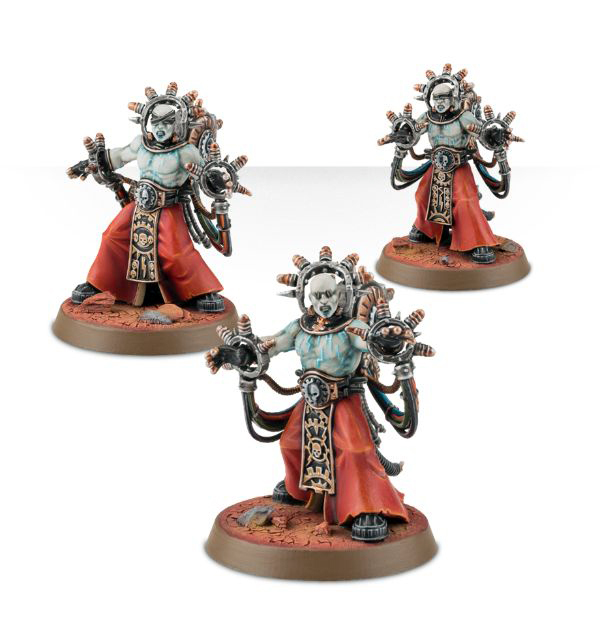 Are you happy with the Cult Mechanicus kits or were you looking for something else? And do you have any conversion ideas you would like to share? I’d be happy to hear from you in the comments section!